We tend to think of autumn as colored leaves and crisp air. 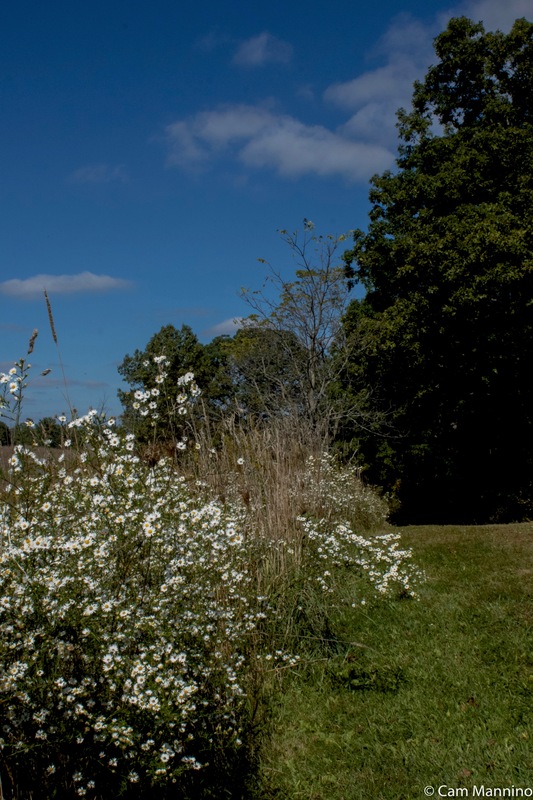 But the prairies and meadows of the township parks celebrate fall with flowers. 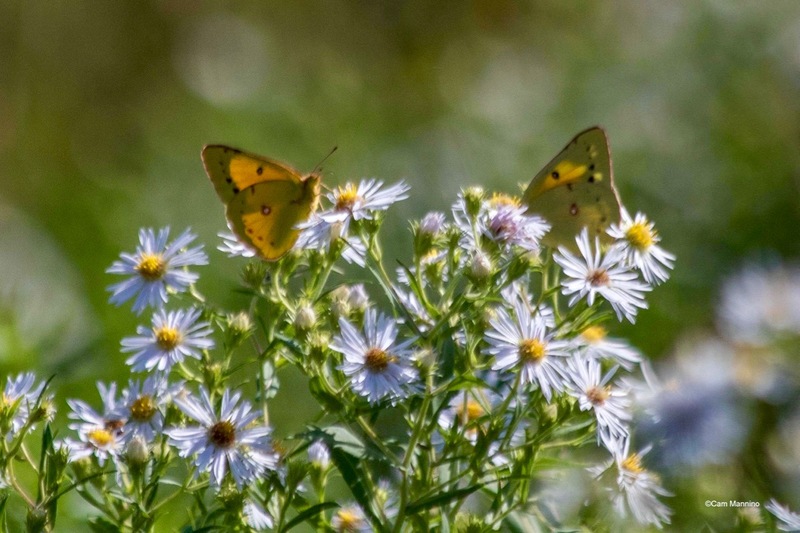 Many asters love cooler weather and right now the restored prairies of Charles Ilsley Park are dressed in white wildflowers, dotted with splashes of gold. Butterflies and bees still flutter and hum among the blossoms and grasshoppers still spring like popcorn out of the grass as you walk. 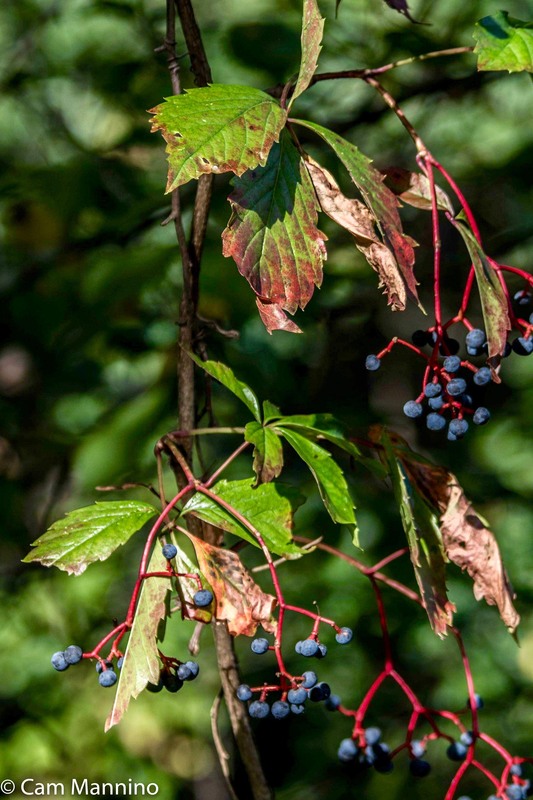 Birds, including occasional summer visitors headed south, eat the plants’ berries and seeds or snag a few insects from bare soil or tree limbs. 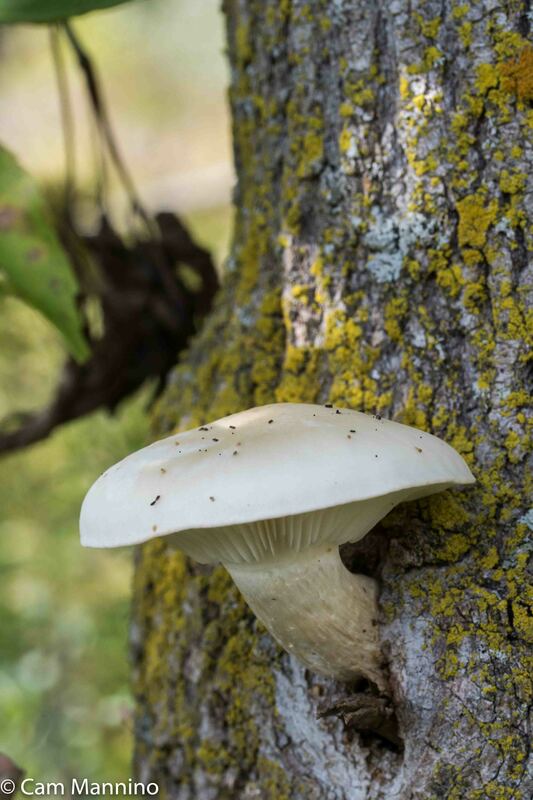 The frantic growth of summer is indeed ebbing, but the park still bustles with life as it awaits the first frost. Note: Click here for a map of the park to help in visualizing the various trails and prairies described. 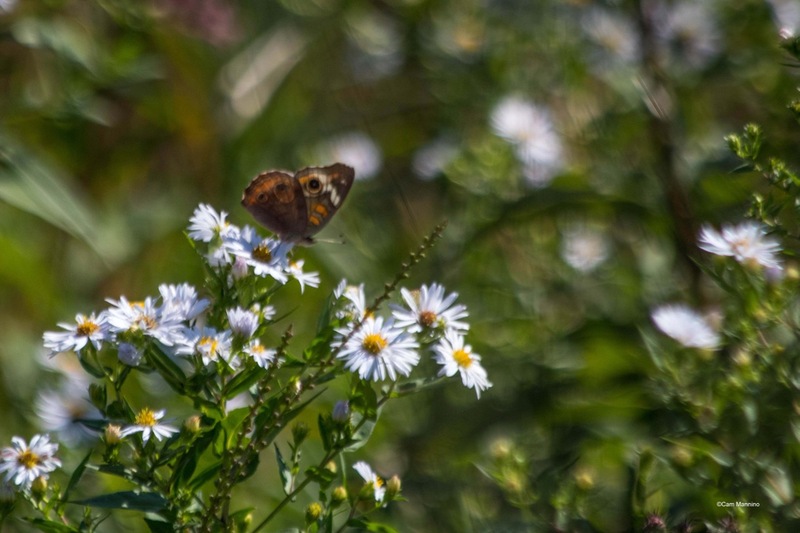 Walking along the mowed trail into Charles Ilsley Park before the latest heat wave, a nodding crowd of graceful Panicled Asters (Symphyotrichum lanceolatum) stood on either side, like a crowd at a procession. Occasionally, a spray of New England Asters (Symphyotrichum novae-angliae) added a little royal purple to the view. 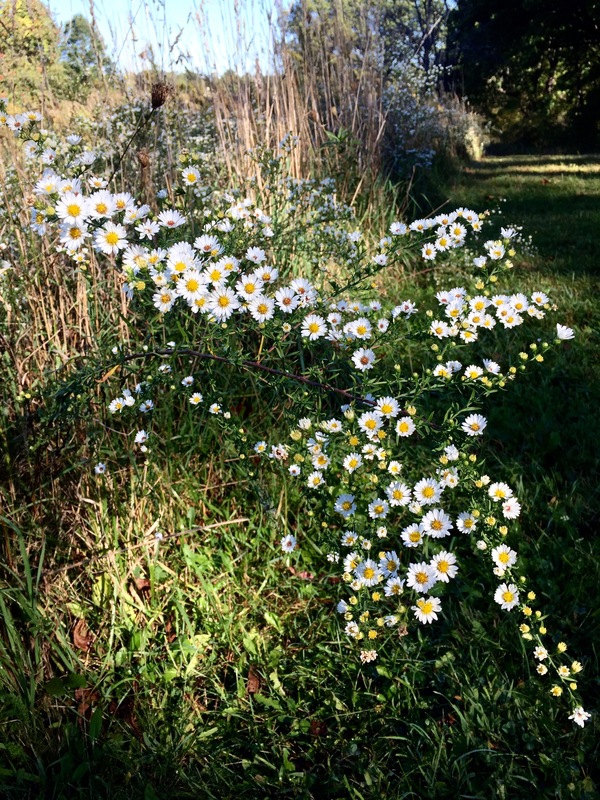 A spray of New England Asters along the entrance trail. Just before sunset one afternoon, several migrating Palm Warblers (Setophaga palmarum) flitted among the branches of a tree along this trail. 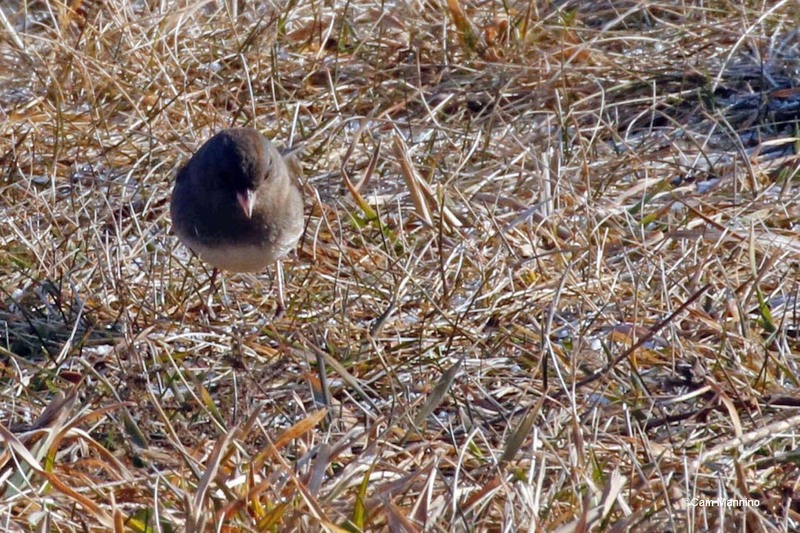 This little bird was probably on its way from Canada to Florida or the Caribbean. 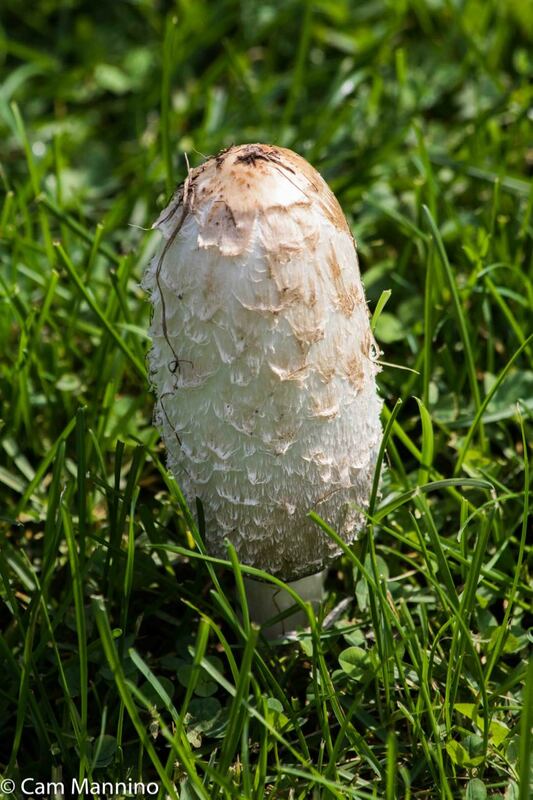 Let’s hope it finds its favorite foods and perches after the terrible storms there this fall! 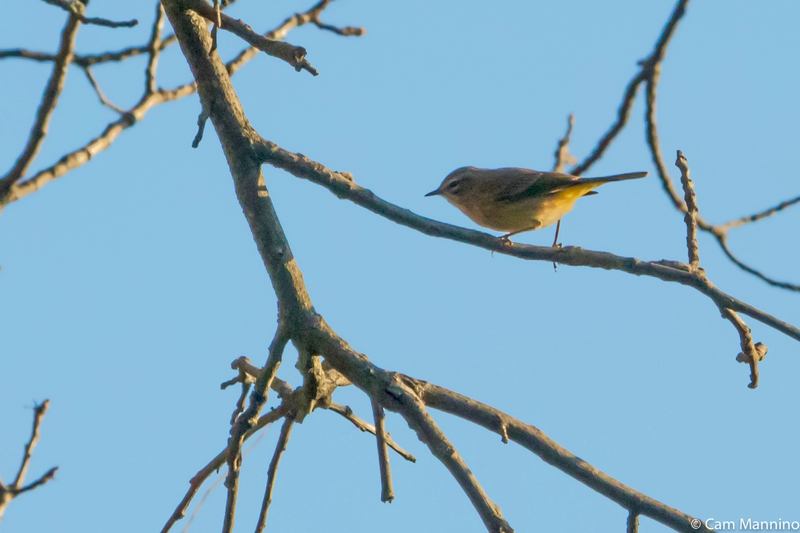 A migrating Palm Warbler paused in the park on its way to Florida and the Caribbean for the winter. 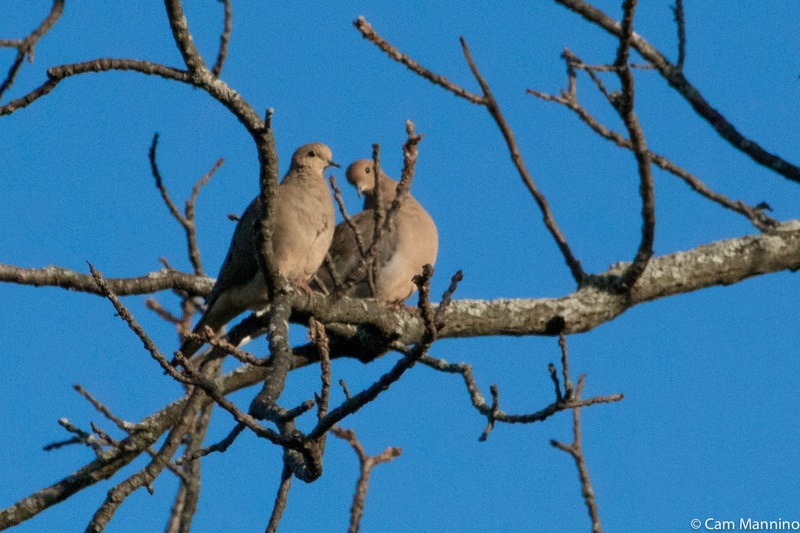 Among some bare branches, a couple of Mourning Doves gave me a closer look. 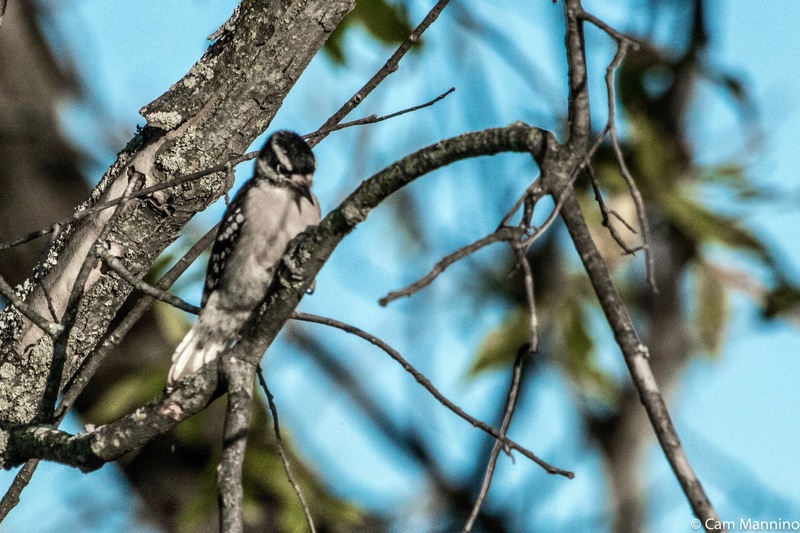 And below, a female Downy Woodpecker (Picoides pubescens) drilled a dead branch for insects, looking for a snack before retiring for the night. 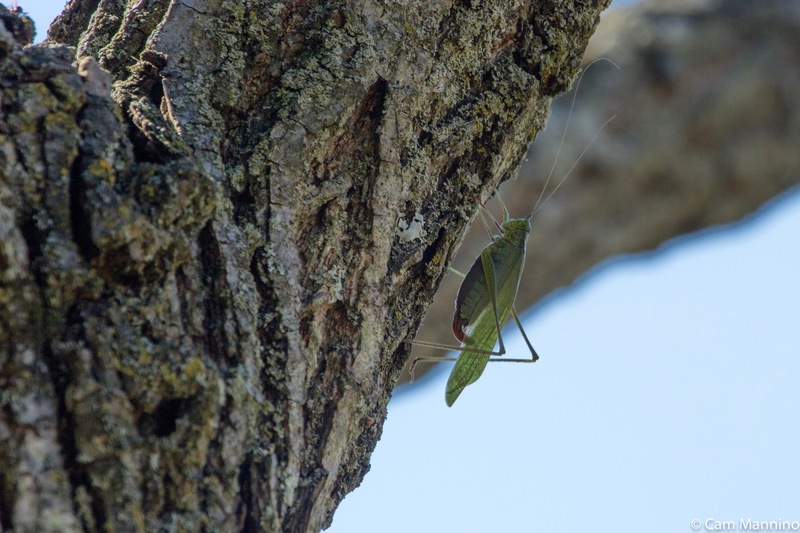 A quick movement out of the grass onto a nearby tree turned out to be a Katydid (family Tettigoniidae) moving slowly along the trunk with its ungainly legs. Katydids are generally nocturnal and sing at night. 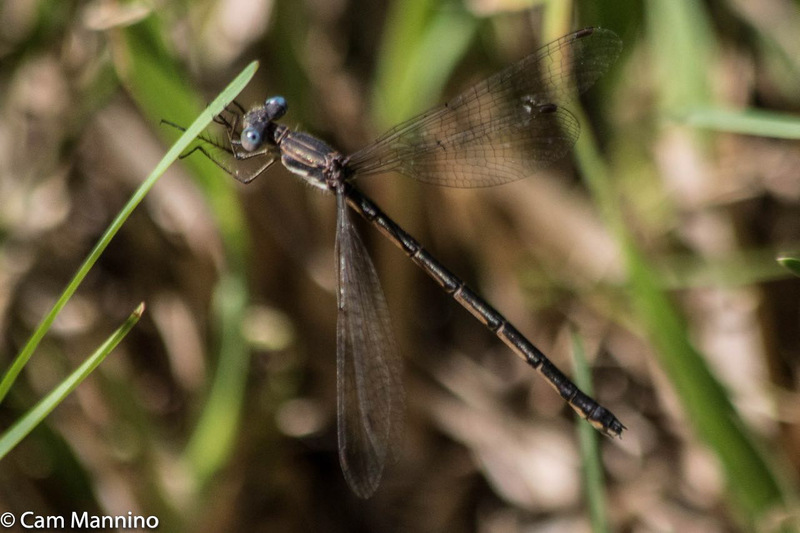 I’m guessing this one’s a female because of what appears to be a sickle-shaped ovipositor for laying eggs. Aren’t her antennae amazing? Grasshoppers have short antennae, but katydid antennae are extravagantly long. A female katydid came out of the field at sunset and began exploring a tree trunk. The central meadow at Charles Ilsley Park is undergoing prairie restoration. Don’t be dismayed by the browned surface in the central area of the park. Like the other three sections already restored (east, north and west), the invasive shrubs and non-native plants have now been removed from this area. This fall, matted grass and leftover branches will be removed and the central area will be planted with native wildflower seed. 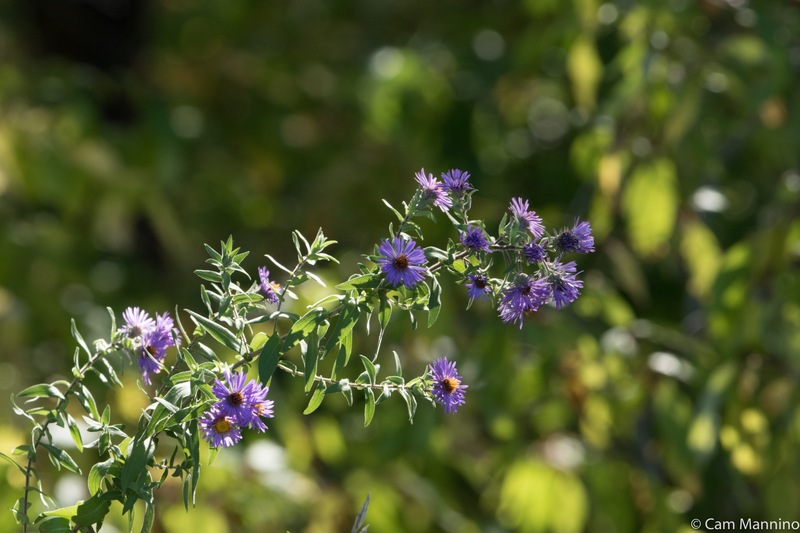 Just as in the other three prairies, it will take 3-5 years for the native plants to fully bloom because as drought-adapted wildflowers, they need time to put down long roots before putting energy into flowering. But even now, life goes on in this brown landscape. 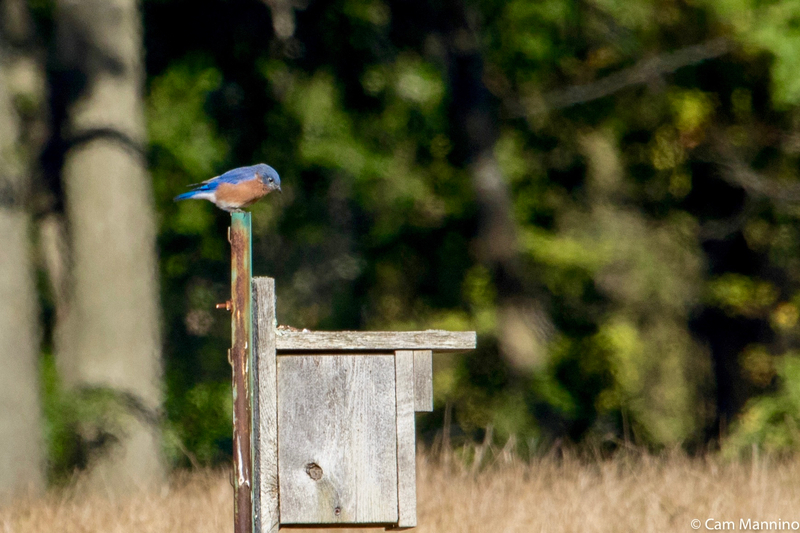 Blue is the first spark of color you’ll see in the restoration area – because the Eastern Bluebirds are everywhere! 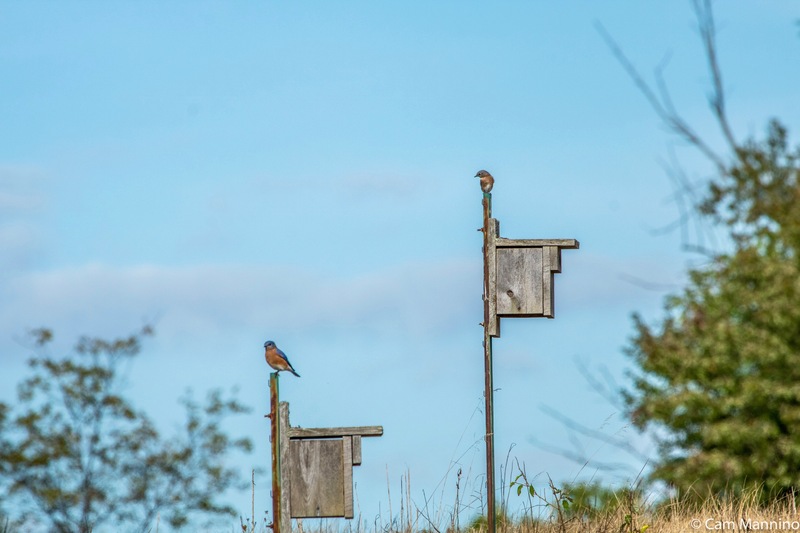 Many of them are using their former nesting boxes for perches as they fly down and forage in the soil and whatever grass remains. This bluebird pair may migrate south or may choose to remain here over the winter. 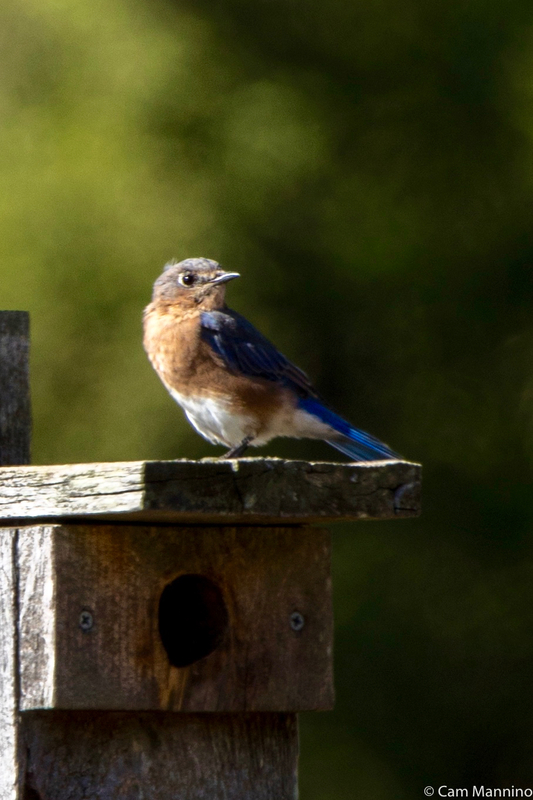 A female Bluebird perusing the brown field before foraging. 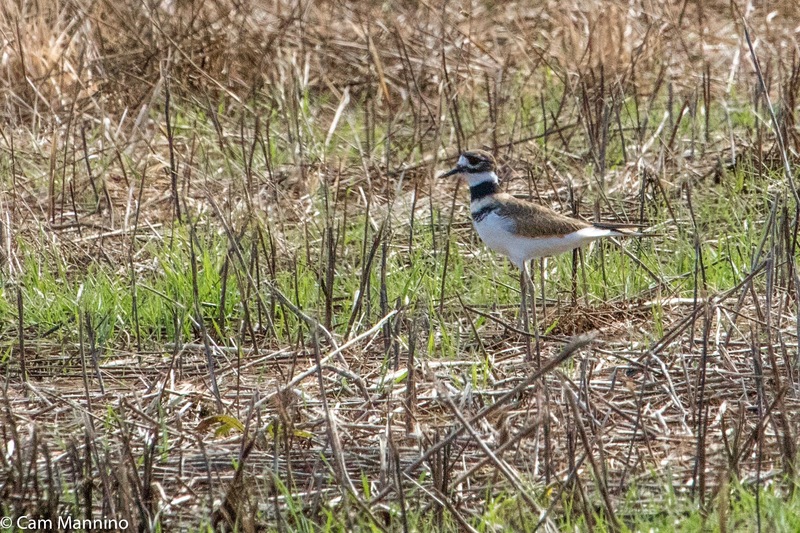 Blackened stems, dead grass and bare soil make a perfect landscape for Killdeer (Charadrius vociferus) who prefer to nest and forage on open ground. 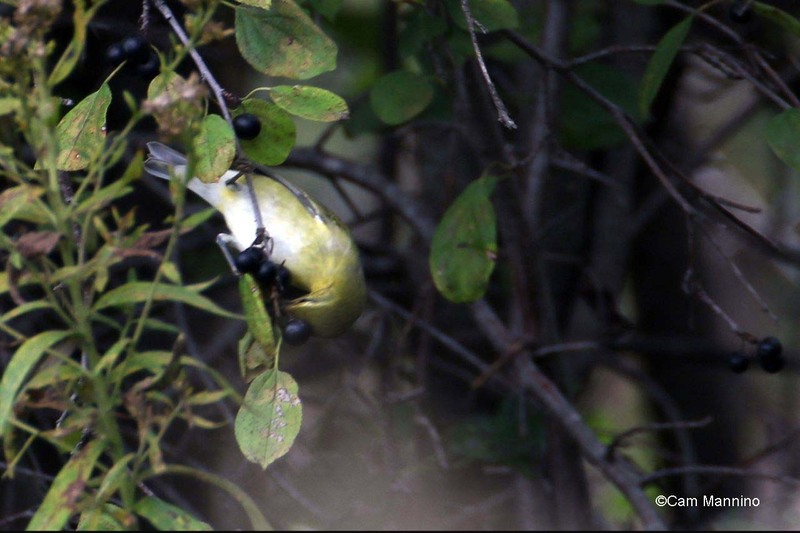 They are known to nest on rooftops, golf courses, even parking lots! They scuttle up and down the restoration field at Ilsley, making periodic quick stops to see if they’ve scared up anything to eat. In autumn, Killdeer gather in small groups (I saw five ) as they migrate as far as Central and South America for the winter, though many choose southern Florida as well. 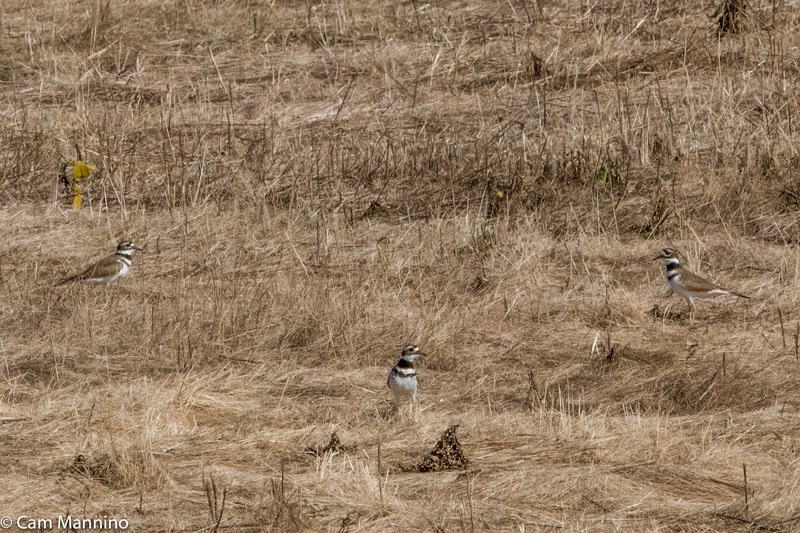 A killdeer scuttles across the dry landscape trying to scare some insects out of the bracken. This Killdeer trio may migrate to Florida or Central and South America. When Killdeer fly, they make a keening call and the feathers on their rumps, just above their tails, flash orange in the sunlight. 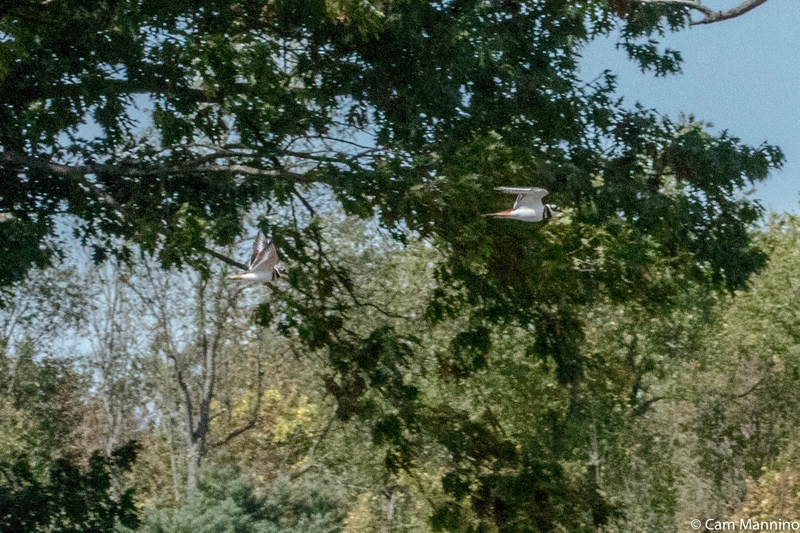 Look for two flying Killdeer in this quick shot. Can you see two killdeer flying with their orange rumps ablaze? 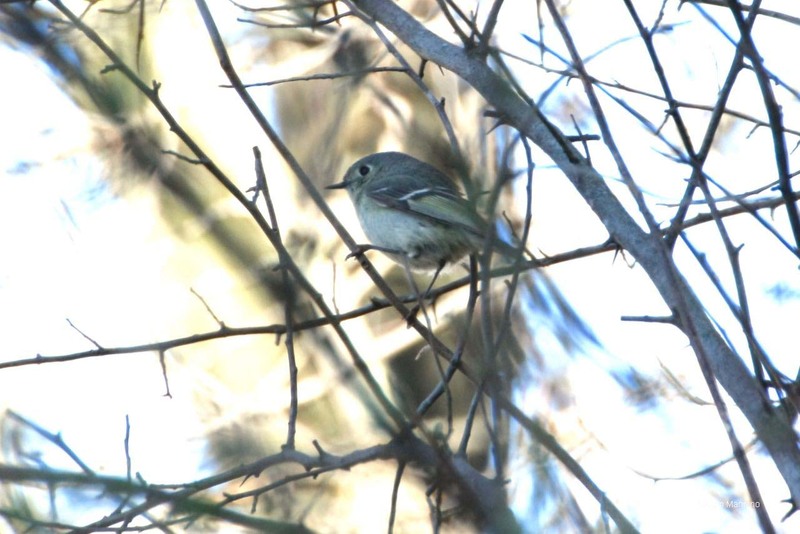 Another ground forager is still here but will also join small groups for migration. Northern Flickers (Colaptes auratus ) love ants, so they too are quite happy to forage in the newly re-sprouting grass or on the bare soil in this area of the park. You’ll often see 3 or 4 together on the ground. 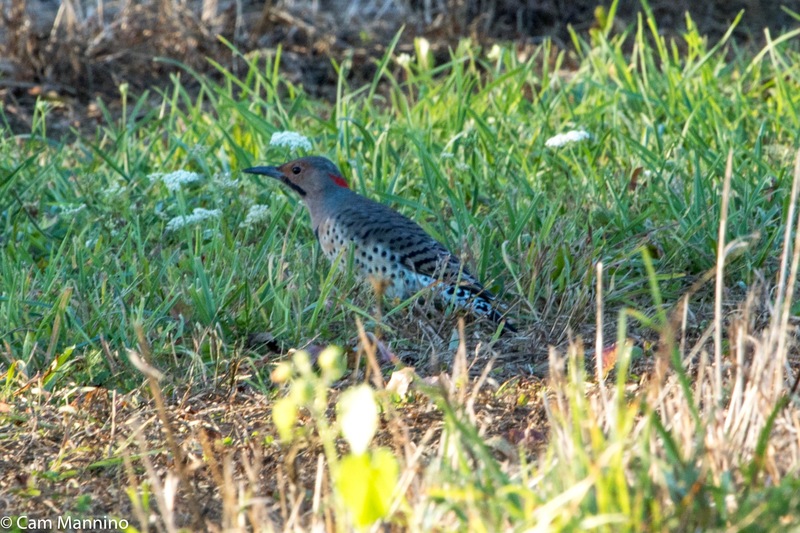 In this season, Northern Flickers can often be seen looking for ants in the restoration area of the park. At the far end of the restoration area are a few bushes that form a line across the bottom of the north prairie. 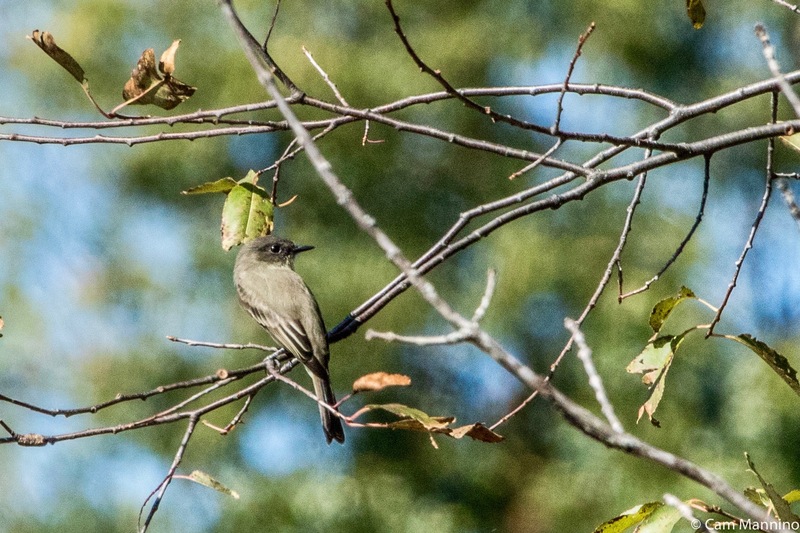 On all four trips to the park, an Eastern Phoebe (Sayornis phoebe) rested in the low branches of a tree there – a perfect perch for a flycatcher who actually prefers ground foraging to catching flies! 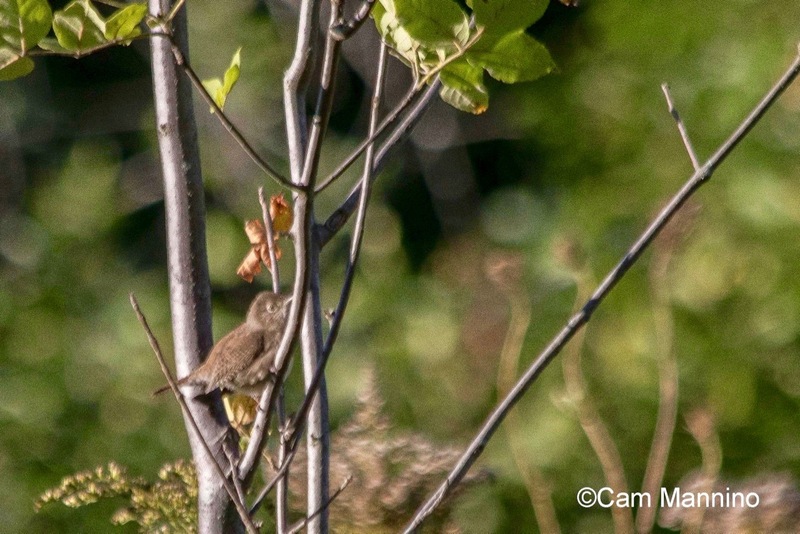 The Eastern Phoebe actually prefers ground insects to catching flies, even though it’s officially a flycatcher. 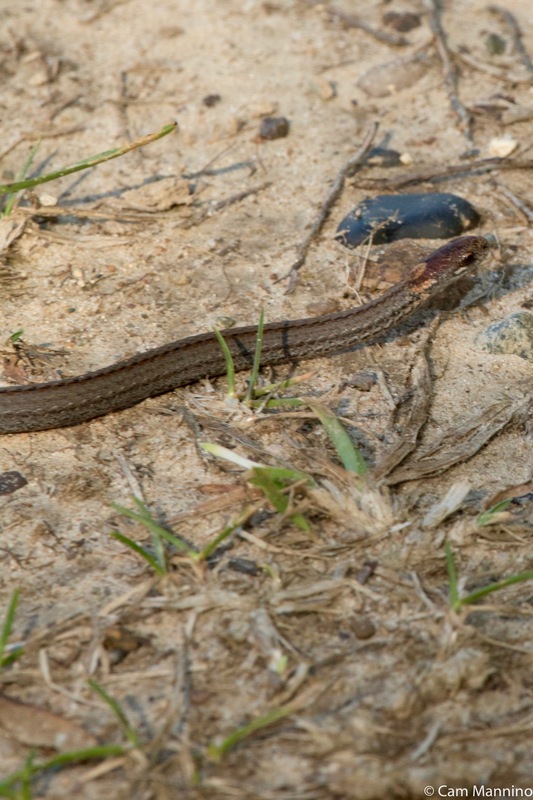 With all those birds around, this immature Northern Brown Snake (Storeria dekayi) had better be careful! These harmless, little snakes (they don’t bite!) are born with a white “collar” around their necks and are either brown or gray. As they mature, the collar disappears and the head is darker. So I’m guessing this one is a juvenile on its way to getting rid of that collar! A young Northern Brown Snake who’s losing the white collar it had at birth. 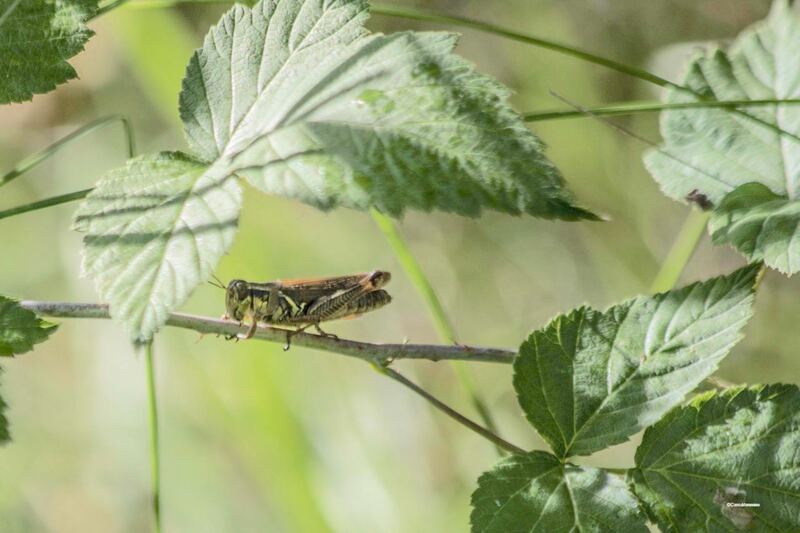 Lots of Life on Three Prairies – East, North and West! 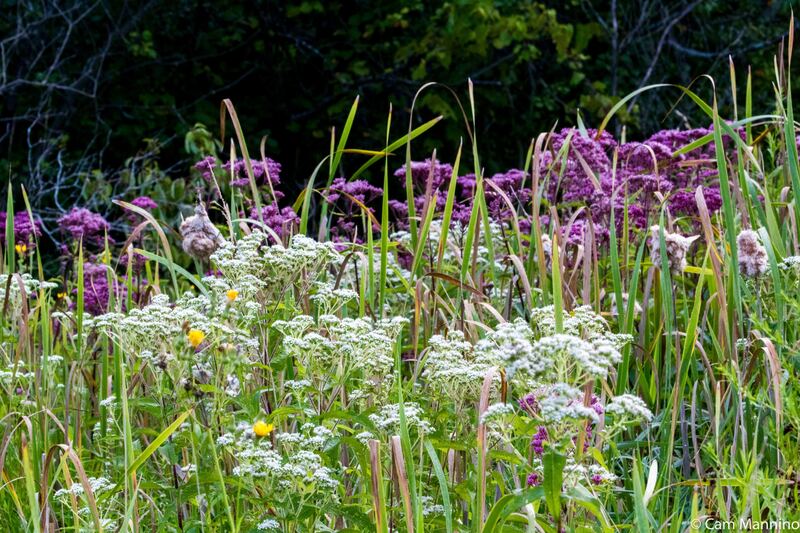 We’re gifted currently with three prairie plantings at Ilsley in various stages of restoration. The eastern and northern prairies are now in their second summer, the western prairie is in its first. All of them host a wide variety of wildflowers, butterflies, bees and birds. Both Bumblebees (genus Bombus) and European Honey Bees (Apis mellifera) buzz quickly over the native blossoms, making the most of late fall nectar. One late afternoon, native bumblebees were driving honey bees off of some flowers with a quick dart toward them, while on other blossoms, honey bees were hassling butterflies. 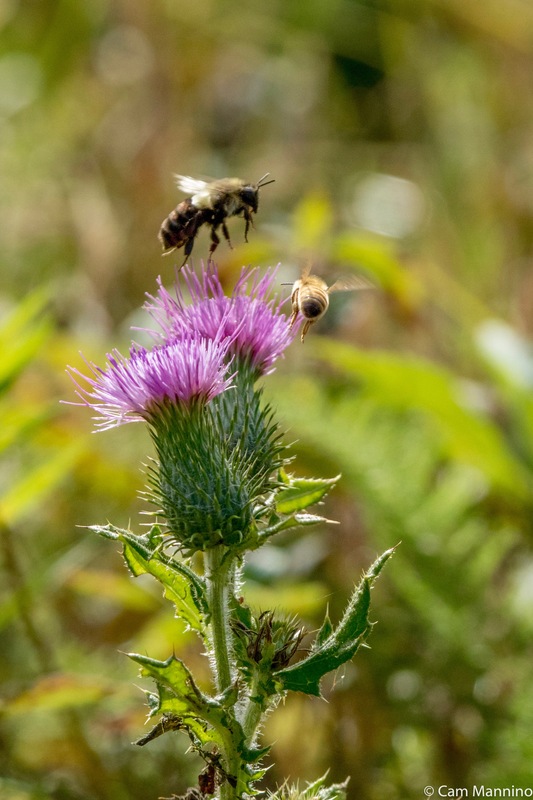 A native Bumblebee and a European Honey Bee compete for the nectar in a non-native thistle. Eventually, however, peace was restored and each found their own blossom on the Calico Asters. 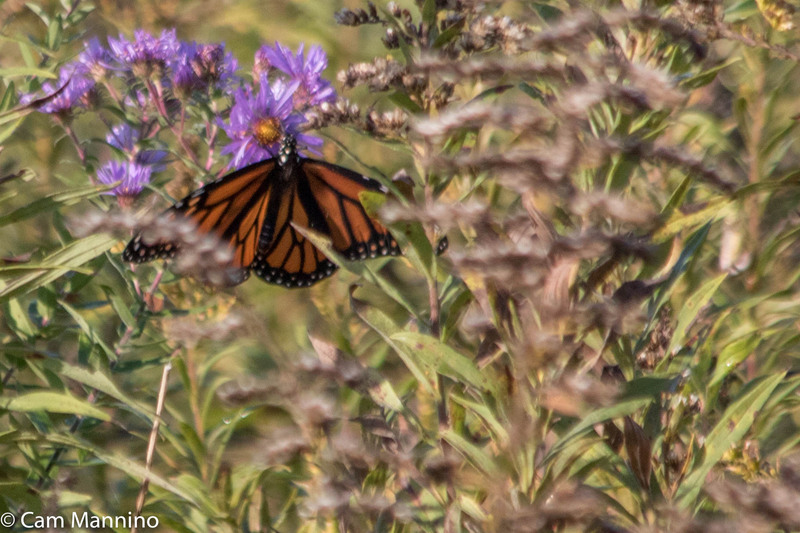 At mid-summer, the prairies were full of large butterflies – Monarchs and three kinds of Swallowtails. This month, though most of the larger ones are missing; only a few tardy Monarch butterflies (Danaus plexippus) sip at blossoms. The unseasonably warm weather may have prompted them to tarry a bit longer than other Monarchs who began moving in September. We hope they make it to Mexico before the cold sets in! A variety of smaller butterflies, some as small as your thumbnail, move restlessly among the blossoms on all three prairies. 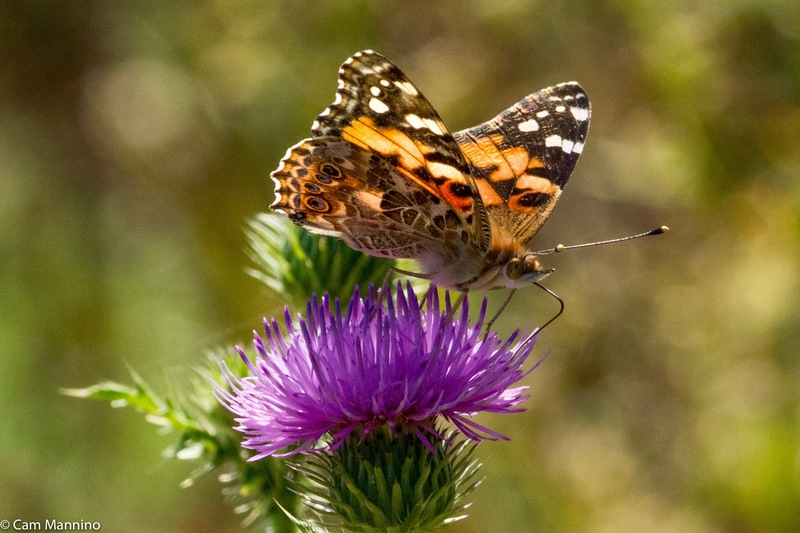 The Painted Lady butterfly (Vanessa cardui) is only 1.5-2.0 inches. 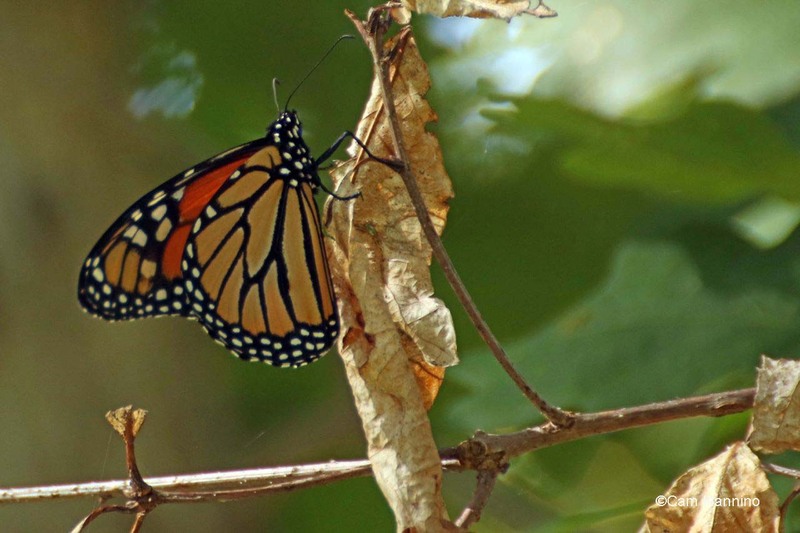 It migrates some years and not others, but often winters in Mexico like the Monarchs. 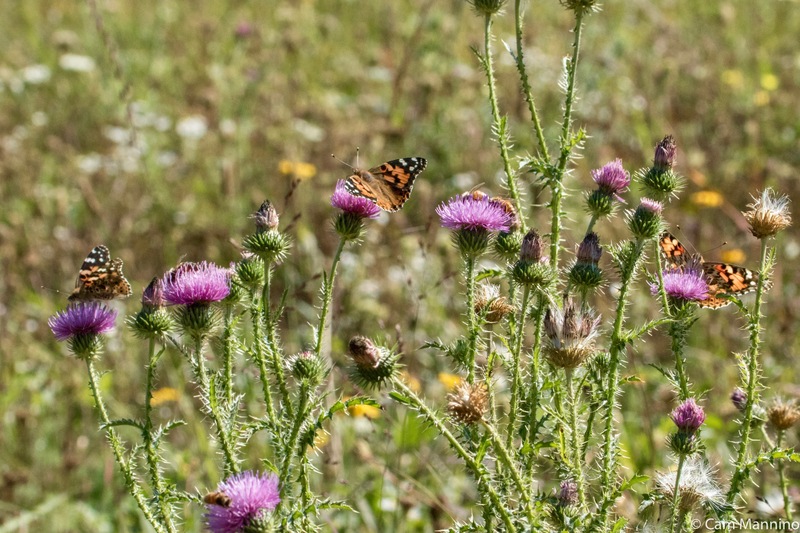 Its caterpillars eat thistle foliage and the adult butterflies love thistle nectar. This one was sipping daintily along with two other Painted Ladies on non-native Bull Thistle (Cirsium vulgare) on the northern prairie. Three Painted Ladies enjoying thistle nectar, just as their caterpillars enjoyed eating thistle leaves. The other small butterflies seemed endlessly restless, doing much more flying right now than eating. I managed to photograph three – but the tiny Grizzled Skipper (Pyrgus centaureae) eluded me, so I’ve borrowed a photo from inaturalist.org with the permission of the photographer, Marian Zöller. 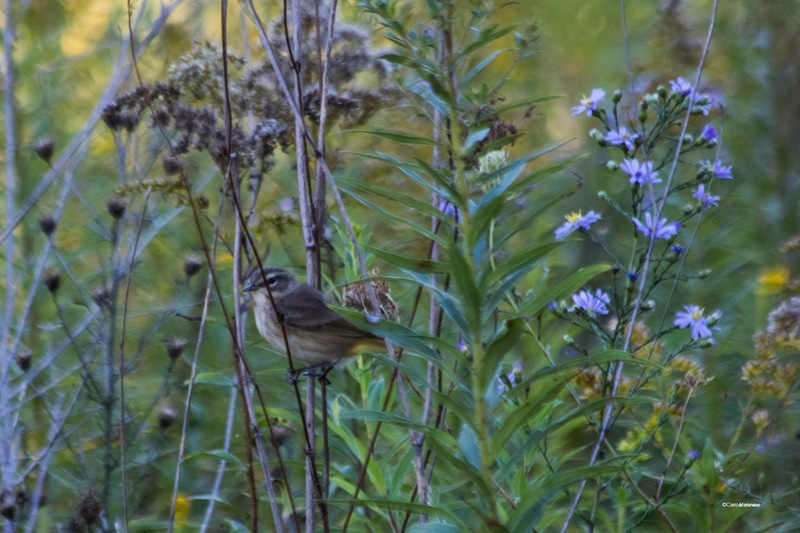 Birds of all sizes frequent these prairies during the year. 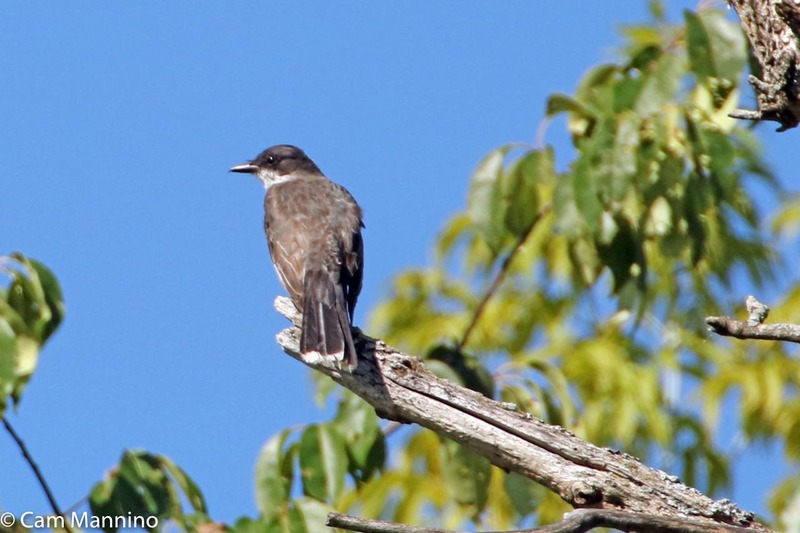 Many of them, like the Tree Swallows, have already begun their fall migration. But one evening at the far end of the eastern prairie, a solitary Sandhill Crane (Antigone canadensis) foraged, probably for just-hatched Red-legged Grasshopper nymphs (Melanoplus femurrubrum) that sprang in hundreds from the grass. Suddenly, it lifted into the air. I wonder if it, too, is beginning its migration to Florida or the Caribbean? 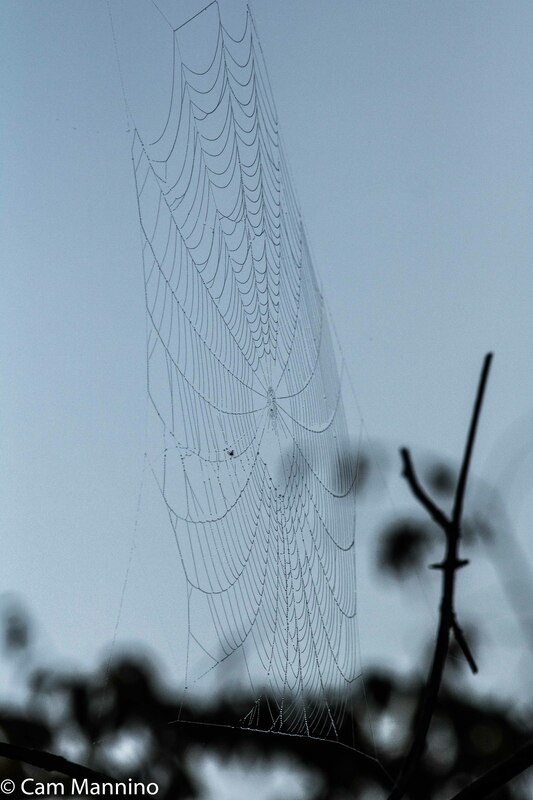 I’m afraid I was too taken with its size, beauty and the snap of its huge wings to set my exposure accurately, but it was a lovely sight just before dark. In an old apple tree on the edge of the western prairie, a flock of pale House Finches (Haemorhous mexicanus) pecked happily at the aging fruit. 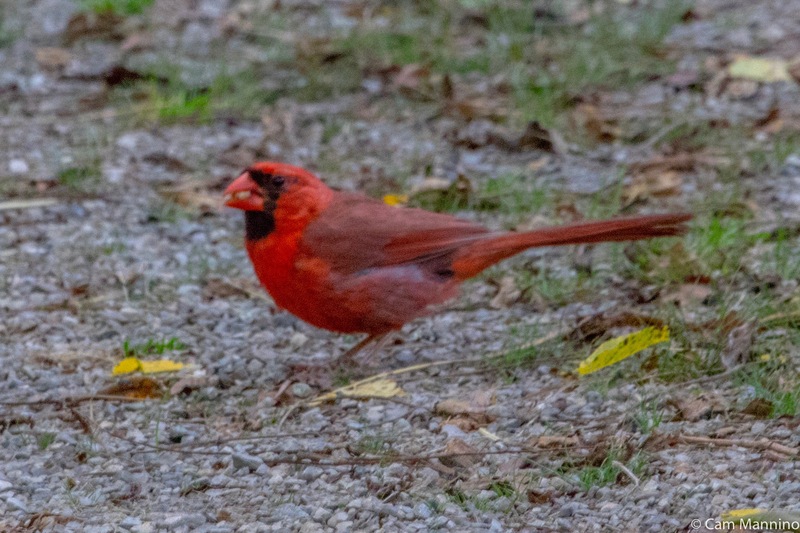 Usually House Finch males are much darker red, but the intensity of the color is determined by what they eat while molting. I have a feeling these were eating apples (or the bugs within them) instead of bright red berries! 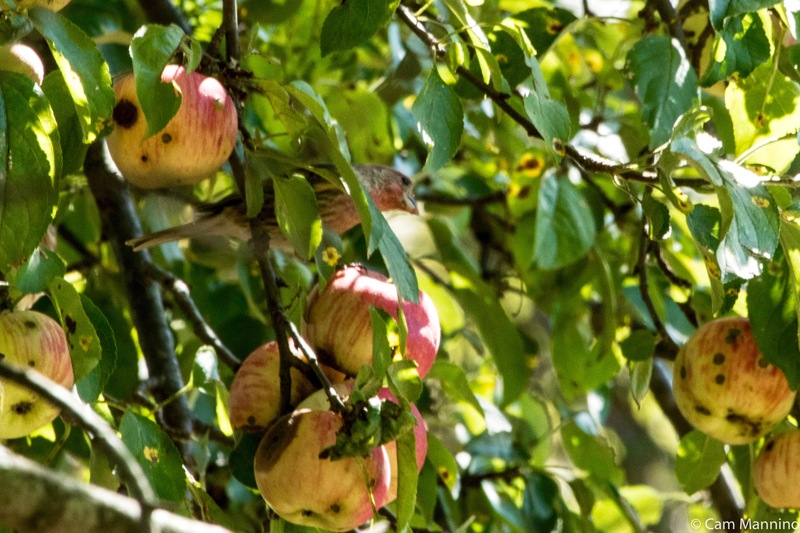 A male House Finch eating bits of apple – or perhaps the bugs inside? And a first for me in Oakland Township! 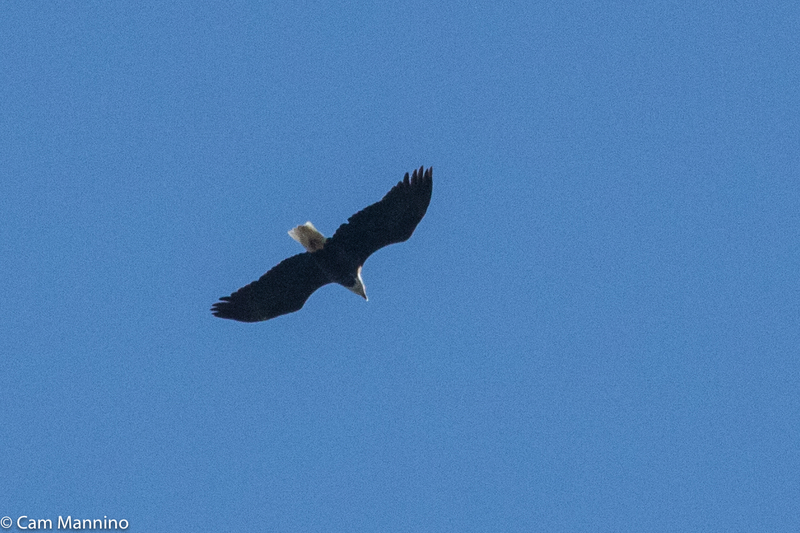 Last Sunday, a Bald Eagle (Haliaeetus leucocephalus) spiraled high into the air over the western prairie, riding upward on a rising current of warm air. What a very special moment to see this powerful bird peacefully enjoying the heat of the prairie on a quiet Sunday afternoon. Two huge oaks trees seem to anchor the past firmly in the present at Charles Ilsley Park. One stands at the south end of the center area that’s being restored and the other stands at the east end of the eastern prairie. The size of these old oaks with their huge trunks and spreading crowns means they’ve been here for hundreds of years, standing watch over the land. Pausing under the eastern prairie tree one afternoon, I took a photo of that tree’s “view” of the restored prairie. It pleased me to imagine that maybe that tree is “looking out on” on a prairie that’s beginning to look a bit like the one it “saw” when it was young so many years ago. And as we watched the bald eagle float above the western prairie, I wondered if it was seeing what its eagle ancestors saw from high in the sky long ago. Humans are such forward-looking creatures, always planning and moving toward the future. 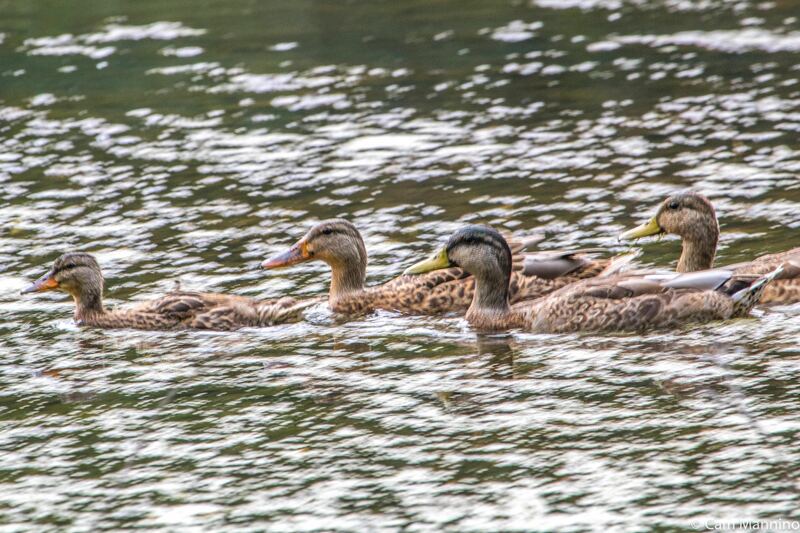 It’s a marvel that here in our township, and in other townships around the country, we’ve chosen to set aside areas like Ilsley where the history of our land and its native creatures can be preserved. 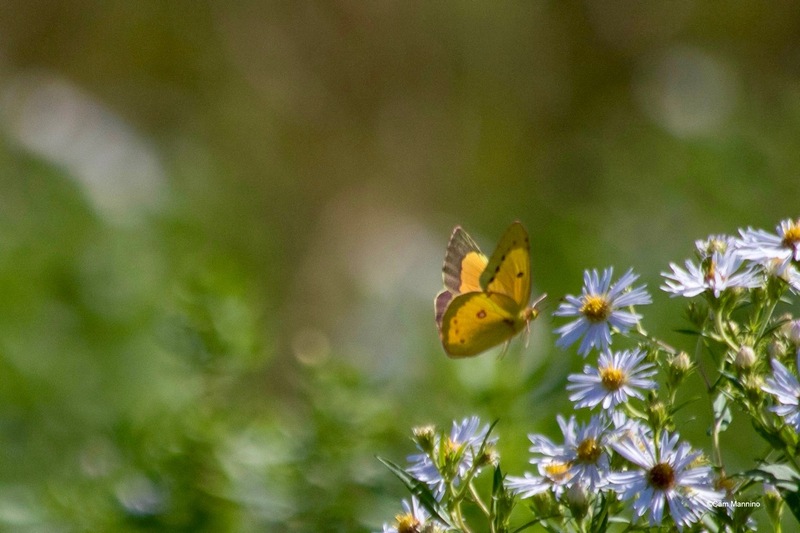 The trees, wildflowers, birds and butterflies – all of it connects us firmly to our past – and if we continue to be good stewards, will sustain and delight us for years to come as we move into the future. Footnote: My sources for information, besides Oakland Township's Stewardship Manager Ben VanderWeide, are as follows: butterfliesathome.com;Pollinators of Native Plants by Heather Holm; Stokes Nature Guides: A Guide to Bird Behavior Volumes 1-3; inaturalist.org;Allaboutbirds.org, the website of the Cornell Ornithology Lab at Cornell University; Wikipedia; Herbarium of the University of Michigan at michiganflora.net; various Michigan Field Guides by Stan Tekiela;Butterflies of Michigan Field Guide by Jaret C. Daniels and others as cited in the text. 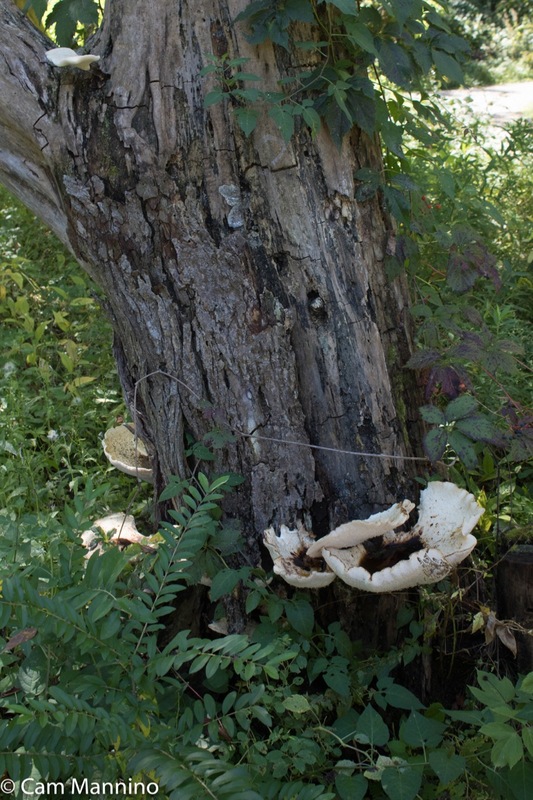 Last week, we explored nature in Bear Creek when it was a working farm 75 years ago. I thought it would be interesting to continue following its history to learn how it became our first publicly protected park. And the source for that information was the “mover and shaker” who envisioned turning this abandoned farm into Bear Creek Nature Park and helped make it a reality – Parks and Recreation Commissioner Alice Tomboulian. Many thanks to Alice and her husband Paul for sharing their knowledge of Bear Creek 45 years ago – and their photos below that I’m using with their permission! Also thanks to Parks Director Mindy Milos-Dale for great info and photos of the Grand Opening of the new park developments in 2003! The only remnant of the farmhouse today – the family grill. 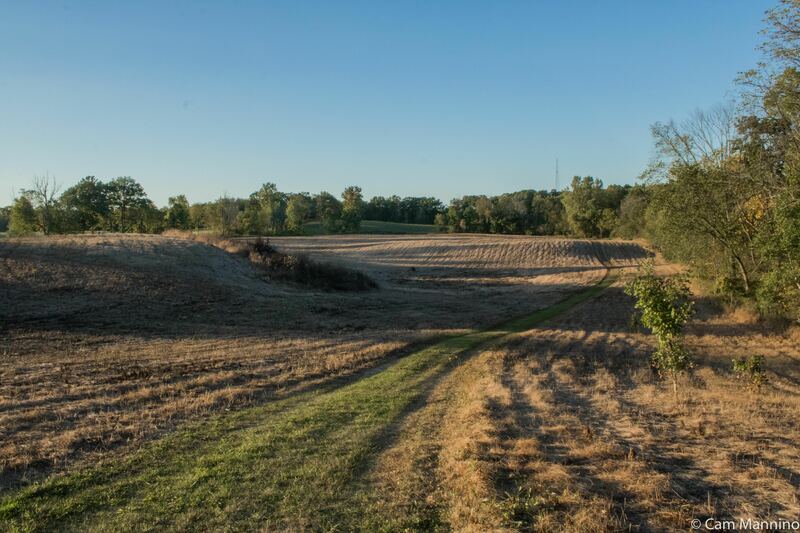 When Alice and Paul Tomboulian and their family moved to Oakland Township in 1969, the land that became Bear Creek Nature Park was abandoned farmland still owned as an investment by Mr. Devereaux of the Richard C. Devereaux Foundation in Detroit (now of Bloomfield Hills). The Tomboulians were naturalists and lived across from this lovely piece of land. 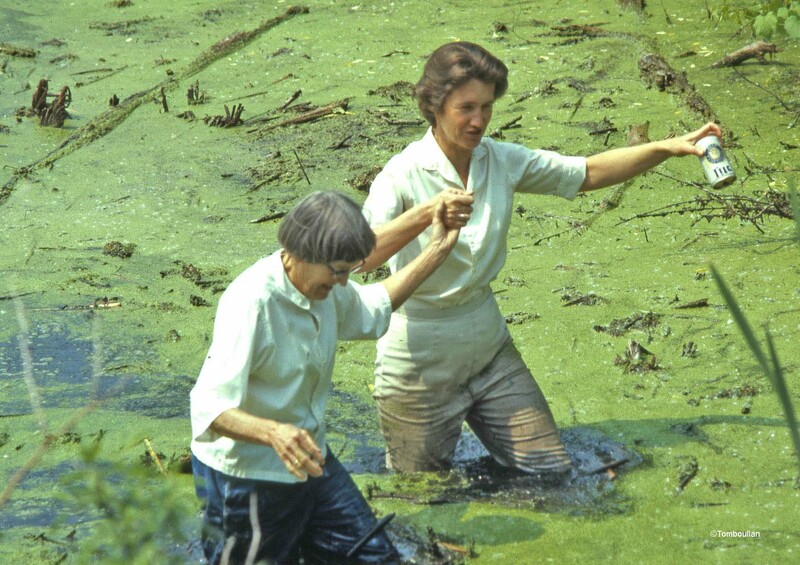 Alice was a volunteer at Seven Ponds Nature Center in Dryden and Paul headed the department of Chemistry and Environmental Health at Oakland University. 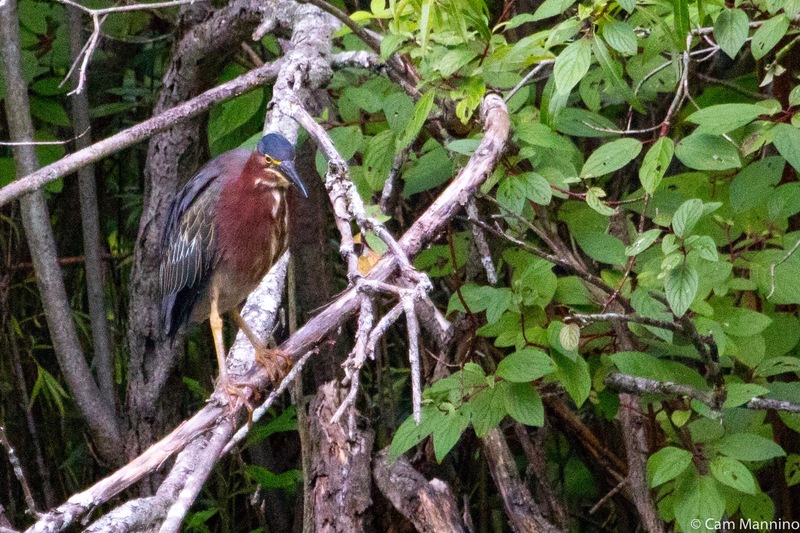 They recognized the importance of those 107 acres – the marsh, the wetlands, the plants and wildlife – for conservation and preservation. In those days, children and their parents exploring empty land was common and not thought at all to be trespassing. So the Tomboulian family skated on the pond near Gunn Road and explored the woods and fields. 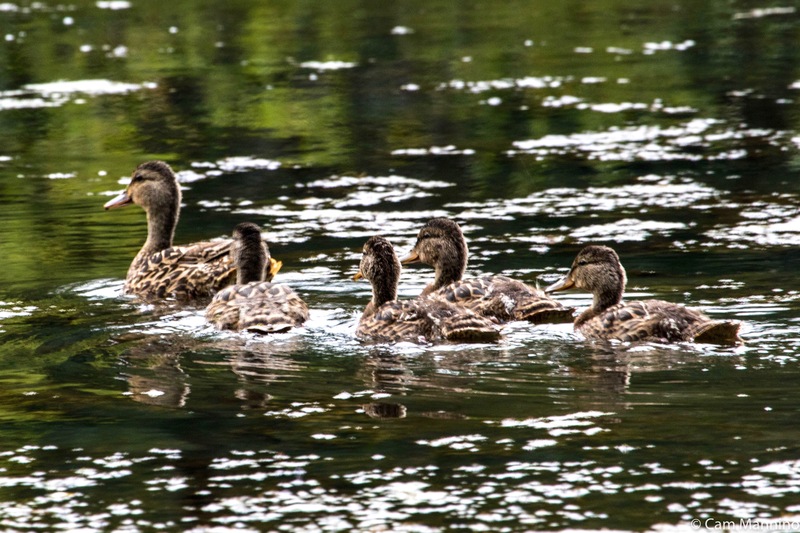 Alice and Paul Tomboulian and their three children used the land that would become Bear Creek as a perfect spot for nature study. Even Alice’s stepmother joined in! Exploring the marsh, for example, took some gusto in those days before the docks were available for observation. 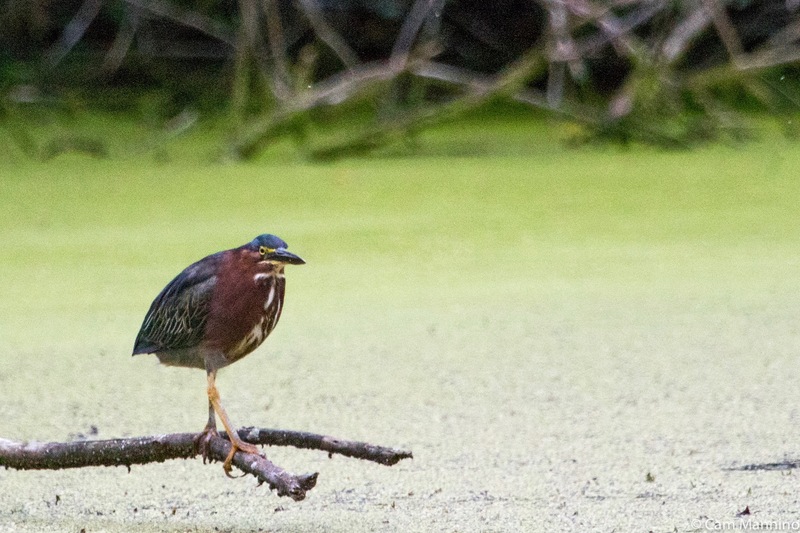 So Alice and her stepmom waded in, fully dressed in old clothes, to explore the reeds for coot nests and other denizens of the marsh. Along the way, of course, they also picked up the same kind of trash my husband and I retrieve in the park from time to time to this day! One day Alice heard a chain saw roaring across the road and hurried over to see who was cutting down trees. It turned out to be the landowner, Mr. Devereaux. 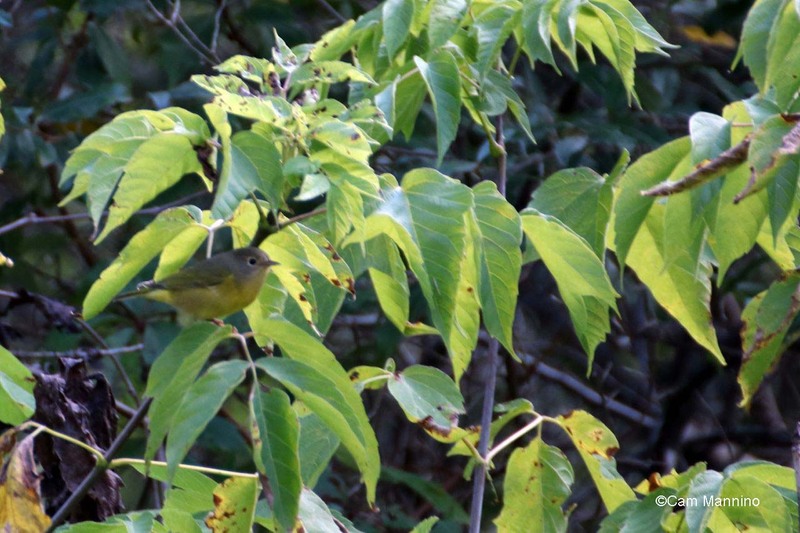 Rather than questioning her interest, Mr. Devereaux was pleased that someone was watching over and protecting his land and gave his permission to explore and later, granted permission for Baldwin School field trips for nature study. Soon school children, their parents and teachers began arriving through a narrow path from Collins Road, which today is a much wider, developed path from the Township Hall. The children below and in the photo at the top of the blog, some sporting “Ranger Rick” neckerchiefs, would be in their fifties by now. 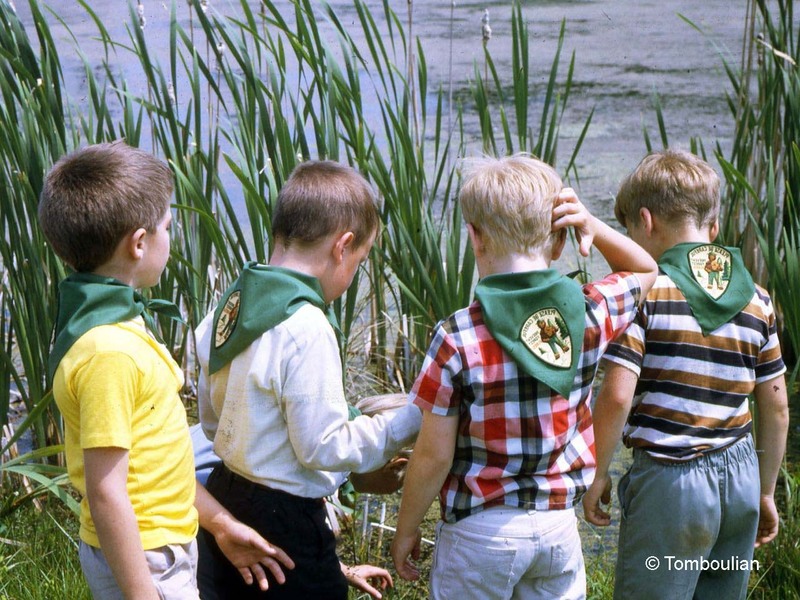 On that field trip on a sunny June day in 1969, the children did a bit of exploring around the pond, though of course no viewing from a deck was possible since none existed. Note the difference between 1969 and now. In 1969, the northern side of the Center Pond was edged only with tall grass – most of it non-native grazing grasses and native reeds. 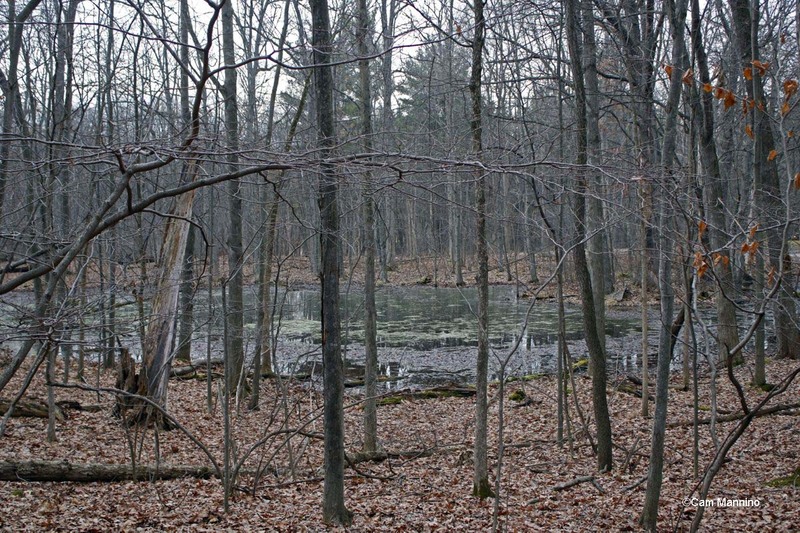 Now the north side of the pond is surrounded by thickets of some native and many non-native invasive shrubs . 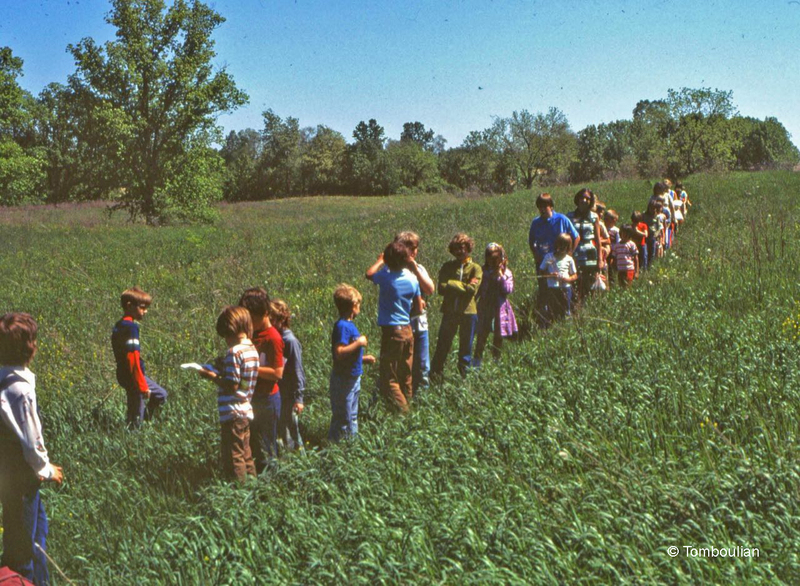 Here’s another group of Baldwin school children coming down the Eastern Path in June of 1969. Then a narrow foot path wound down through the eastern Old Field where the grass planted to feed the cows was starting to grow tall. School children in 1969 coming down the narrow footpath that now is the Eastern Path. 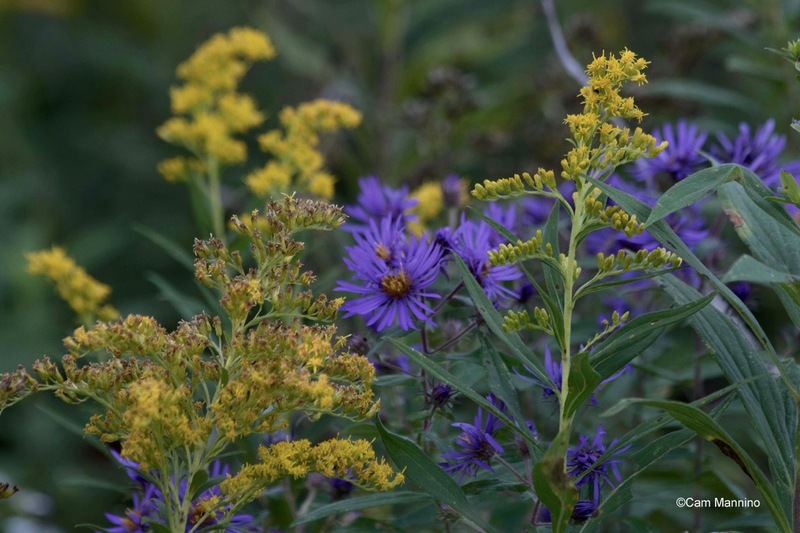 Now a wider, developed trail follows the same path but over the years, thanks to the stewardship of the Parks and Recreation Commission, native Canada Goldenrod and other native wildflowers have made a big comeback. 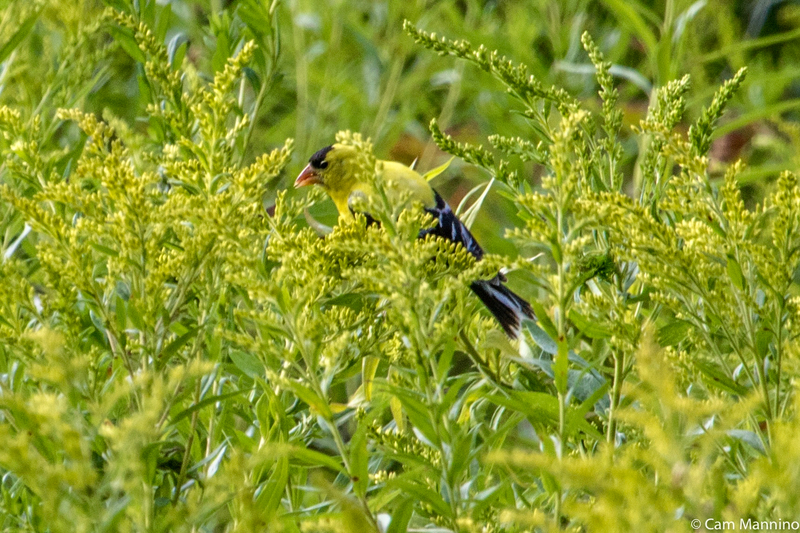 Black-eyed Susans, Coneflowers, Prairie Dock and Common Milkweed, beloved by Monarch butterflies, live peaceably beside non-native wildflowers like Queen Anne’s Lace and Ox-eye Daisies. 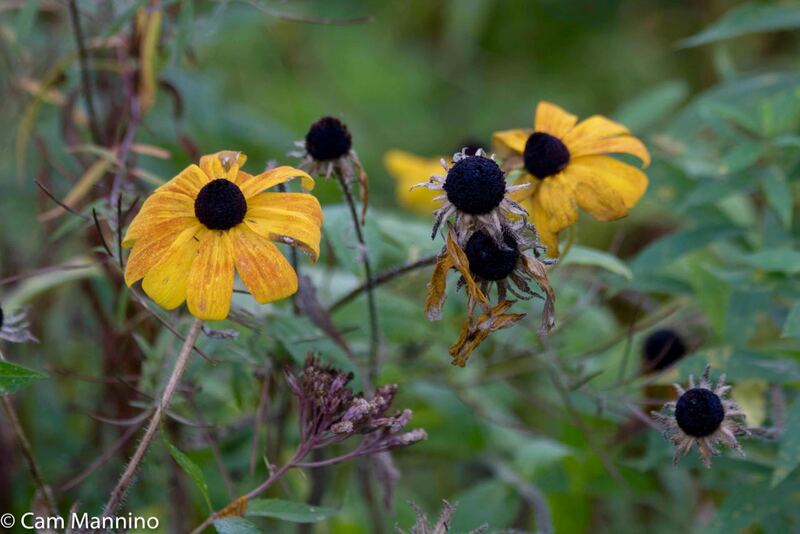 Yellow Cone Flower is a perennial native wildflower. Paul Thompson’s description of the oak-hickory forest and Bear Marsh on the north end of Bear Creek Nature Park, which he labeled as areas W-67 and W-68. 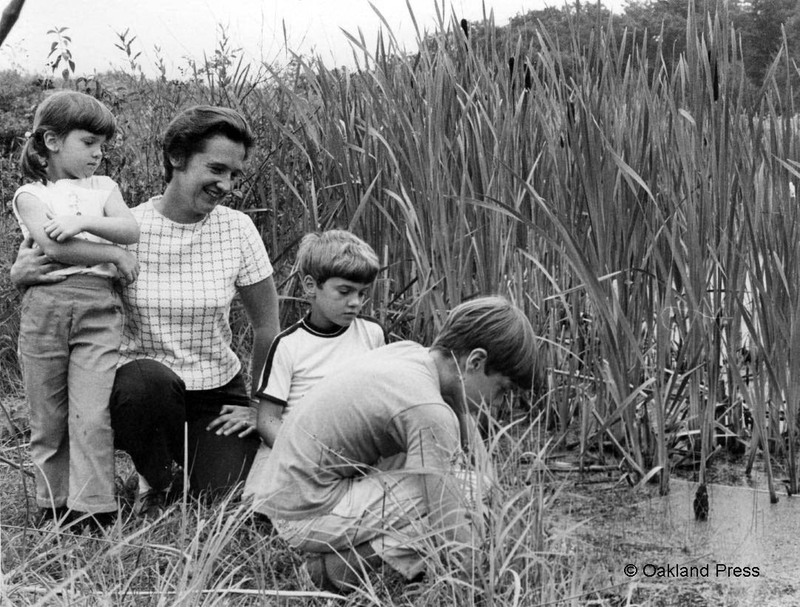 Alice Tomboulian and from right to left, her three children Nancy, Mark and Jeff, exploring nature at Bear Creek Marsh in the 1970’s. Photo from Oakland Press. In the ’70s, Alice was serving on the Oakland Township Board of Trustees. 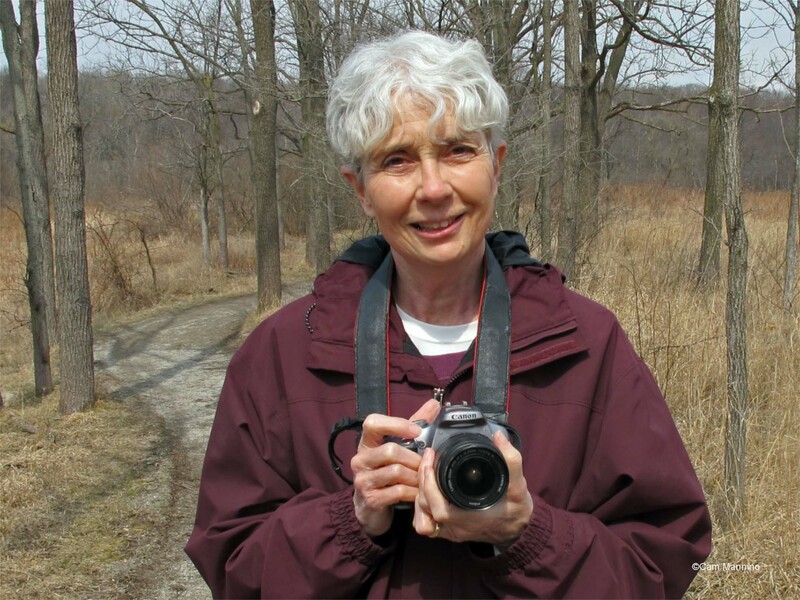 Armed with her own nature study and her son Mark’s wonderful list of the wildlife and plant life in the marsh, she proposed to the Parks Commission the creation of the township’s first park by buying Mr. Devereaux’s property. 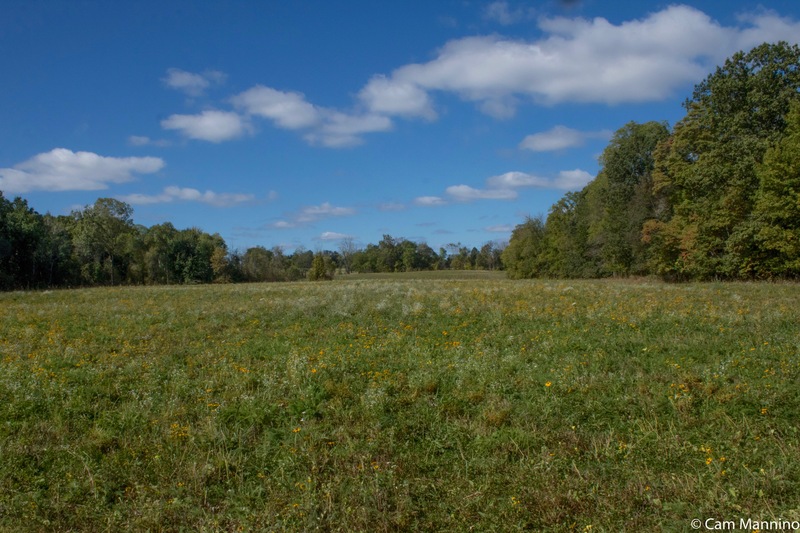 And in 1977, The Oakland Township Parks Commission purchased the 107 acres of land which is now Bear Creek Nature Park using $305,000 from the Parks Millage Fund. Alice, the PRC, and the Township worked with the Oakland County Road Commission for 16 years to correct this problem. According to Paul Tomboulian, the old culvert eventually “was replaced with a new 78-foot long pipe in 2003, new water levels were set, and erosion control measures near Gunn Road were installed.” Now, the water level has returned to more normal levels and bulrushes, cattails and marsh wildlife are returning to Bear Creek Marsh. Later, when the Parks Commission became the Parks and Recreation Commission, the PRC moved to make Bear Creek Nature Park even more accessible to the public. 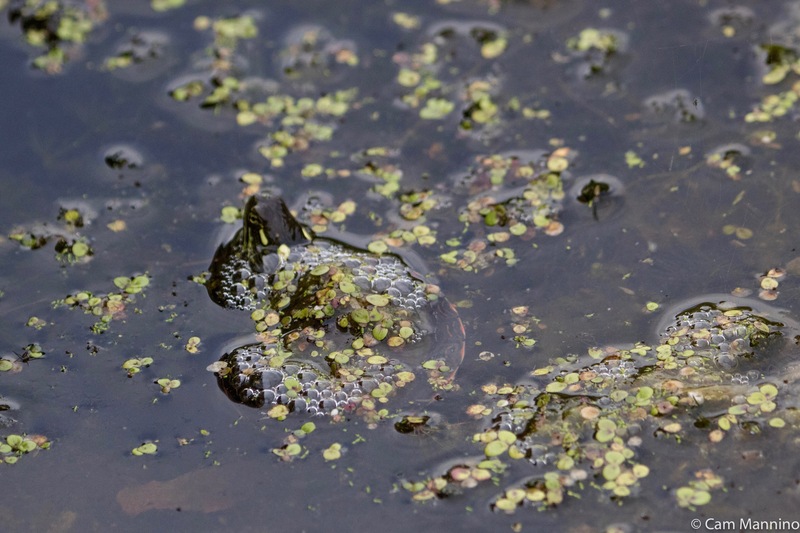 With the approval of commission members, Parks Director Mindy Milos-Dale sought out and wrote the Township’s first grant from the Michigan Natural Resources Trust Fund. The grant proposal was accepted and paid for 44% of the cost of facilities improvements at the park. 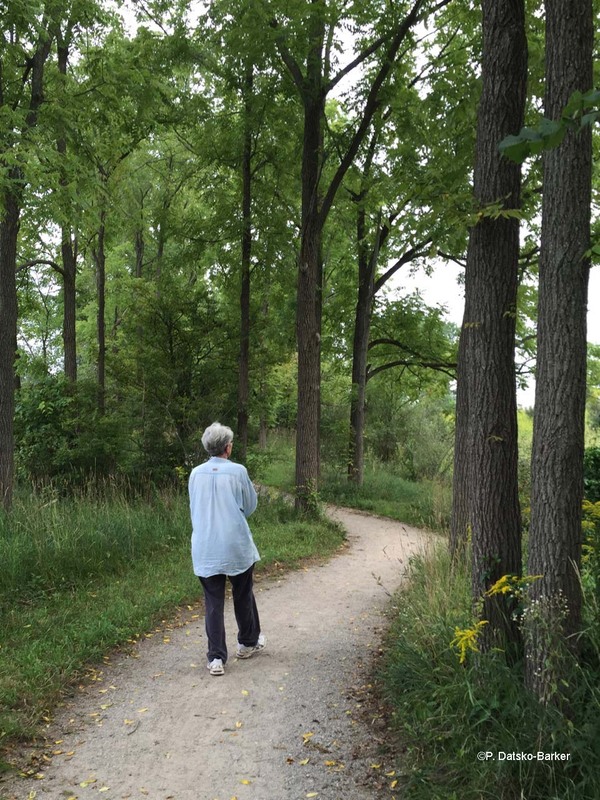 They included ADA accessible limestone trails, wooden boardwalks, docks and overlooks in wetland areas, a picnic pavilion, a children’s play area, a gravel parking lot and restroom facilities. The remaining cost was matched from Parks Millage Funds. 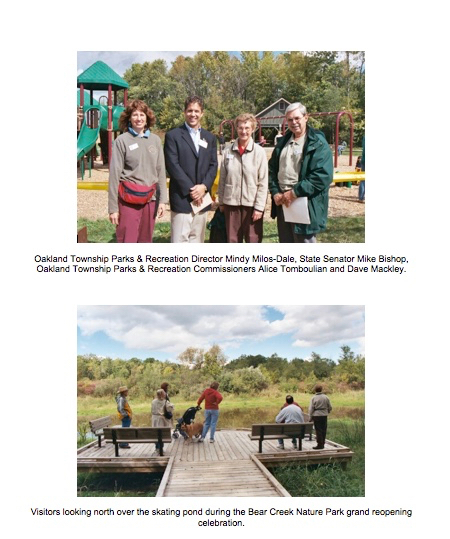 After all the careful planning and financing was done, Bear Creek Nature Park had its Grand Opening on September 27, 2003. Visitors, like us today, enjoyed the Old Fields filled with the gorgeous orange and purple of fall’s Canada Goldenrod and New England Aster. They could hear Canada Geese and Sandhill Cranes crying overhead as they headed south. Visitors watched water birds from the observation deck as they do today. 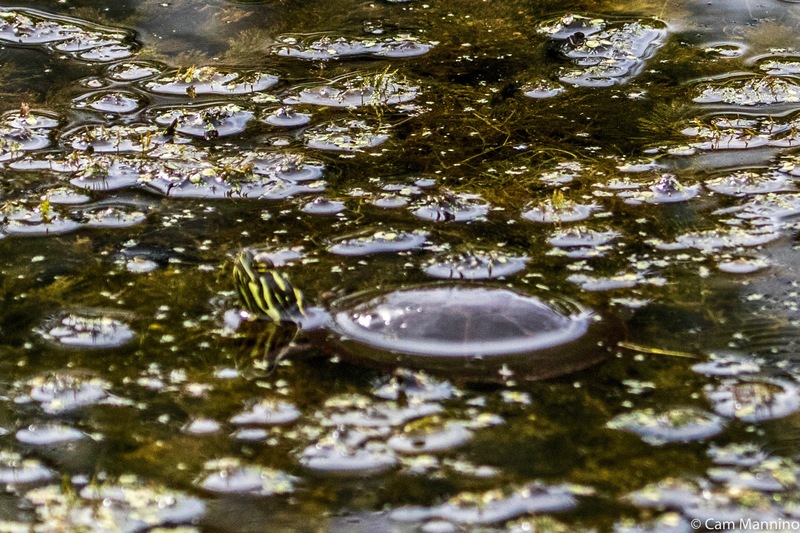 Muskrats and snapping turtles swam peacefully in Bear Creek Marsh. What a journey! We owe a debt of gratitude to the vision, consistent effort and careful study of the Tomboulians, PRC commissioners over the years, Parks Director Milos-Dale and the support of many park-loving Trustees whose foresight and careful planning protected the marshes, meadows and woodlands of Bear Creek for all of us who enjoy its very special beauties today. 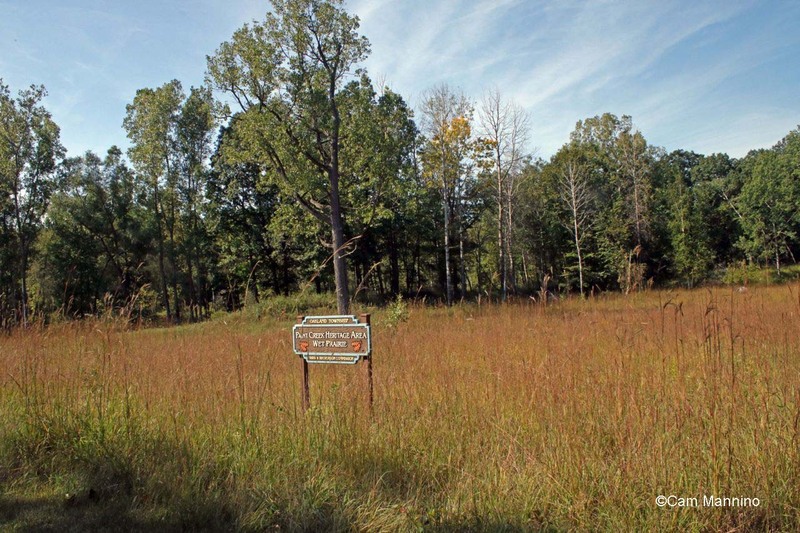 Off the western side of the Paint Creek Trail just north of Silver Bell Road, a sign indicates that you’re passing through a “wet prairie.” Big Blue Stem grasses bend in the wind while all kinds of beautiful wildflowers flourish in the grass below. 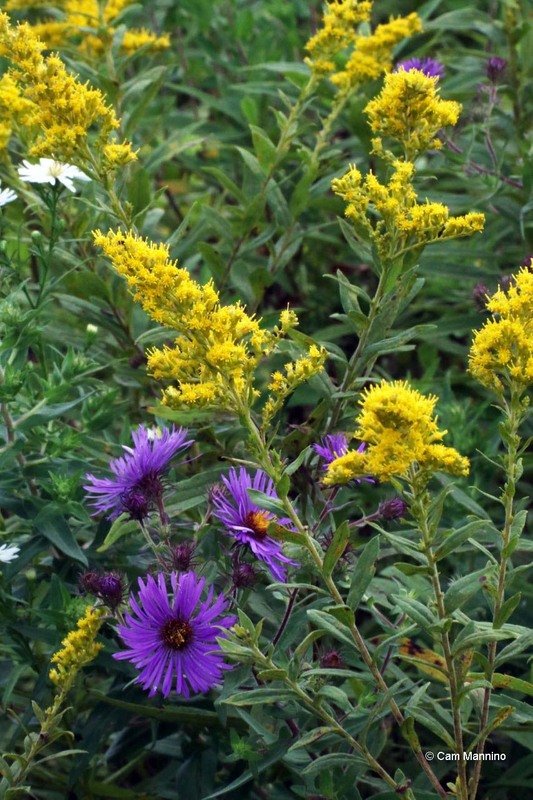 If you ever thought “native wildflower” just meant Canada Goldenrod or Black-Eyed Susans, you’re in for a treat. The Wet Prairie is located north of Silver Bell Road on the Paint Creek Trail. 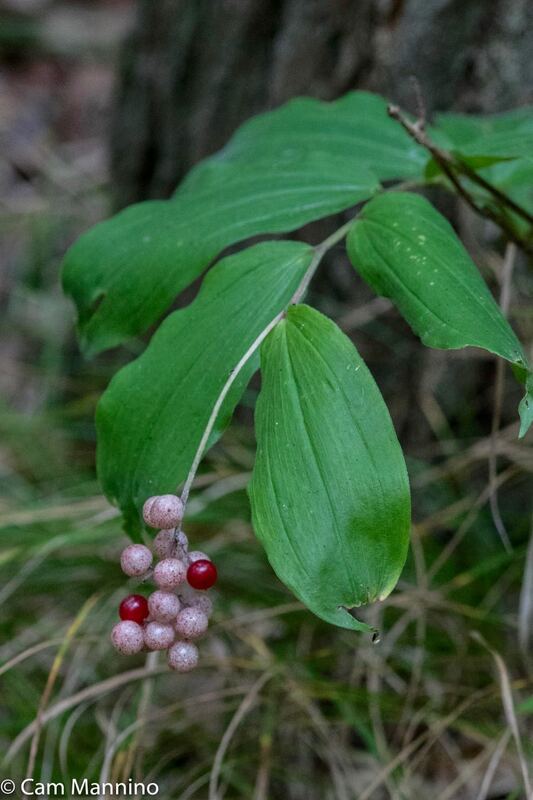 As many of you know, most native plants in this area are adapted to fire because of thousands of years of natural fires and regular burning by Native Americans for purposes of clearing and fertilizing the land. Once the trains came through in the 19th century, the sparks from the tracks, where the trail runs now, regularly started fires in the area. Native prairie and savanna plants survived because they had adapted to fire; non-native plants were less likely to do so. Once the trail replaced the train tracks, stewardship was required to preserve this very special environment. 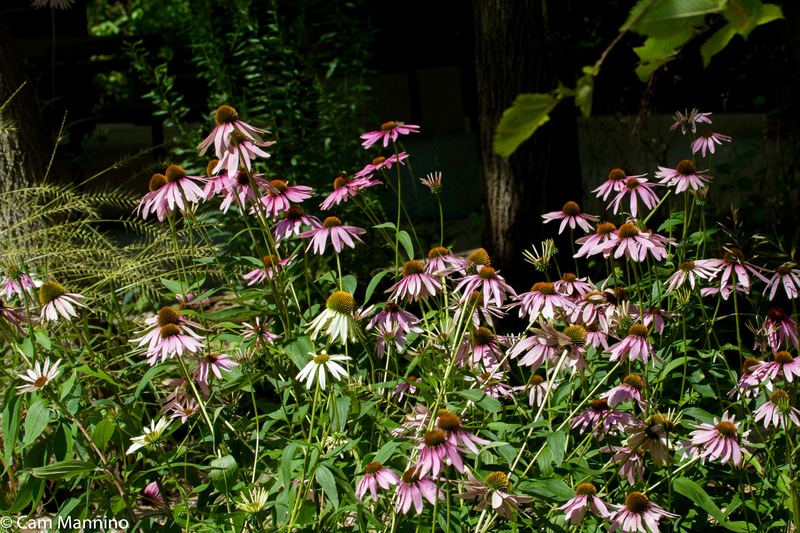 Over the years, the Parks Commission has worked to restore this patch of wet prairie and its beautiful native plants. 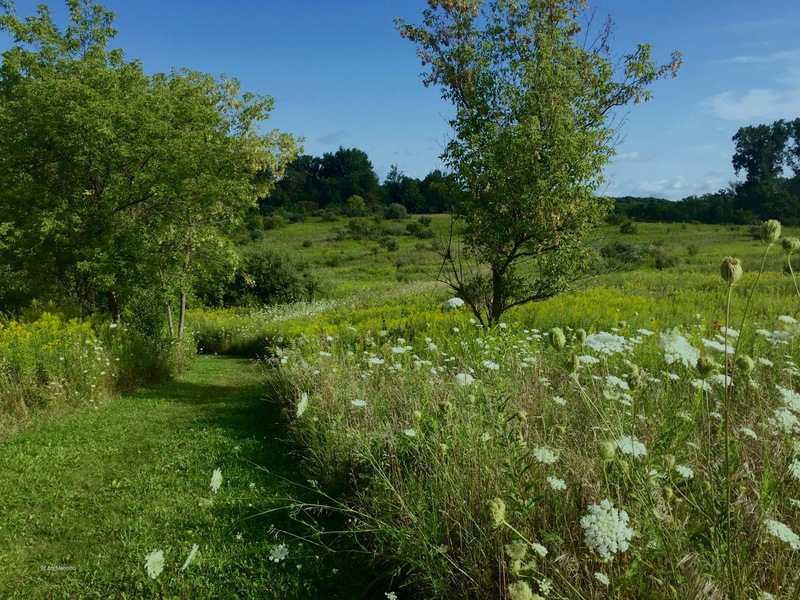 Last year, Stewardship Manager Ben VanderWeide and his crew worked long hours from Silver Bell Road to the Wet Prairie, removing Autumn Olive and other non-native plants, trees and shrubs that lined the trail and crowded the field, shading out native plants. 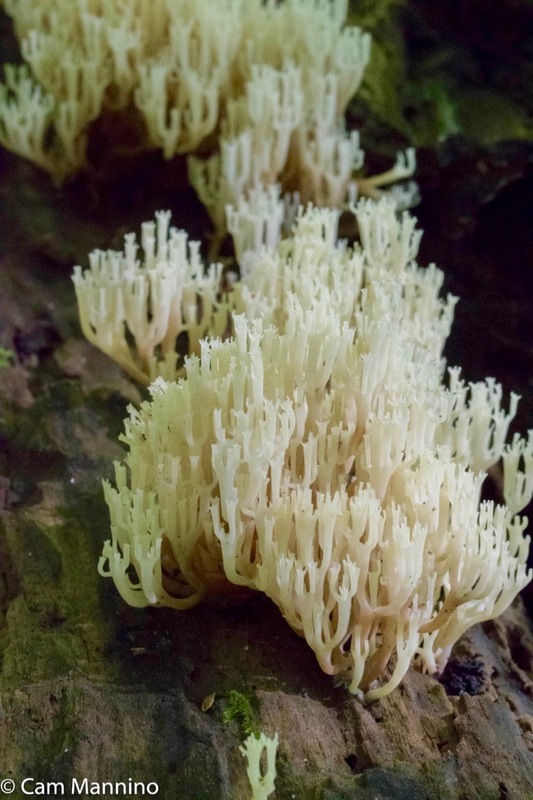 We thought you might enjoy seeing a small sampling of the beauty that’s begun to flourish in this special area because of those efforts. 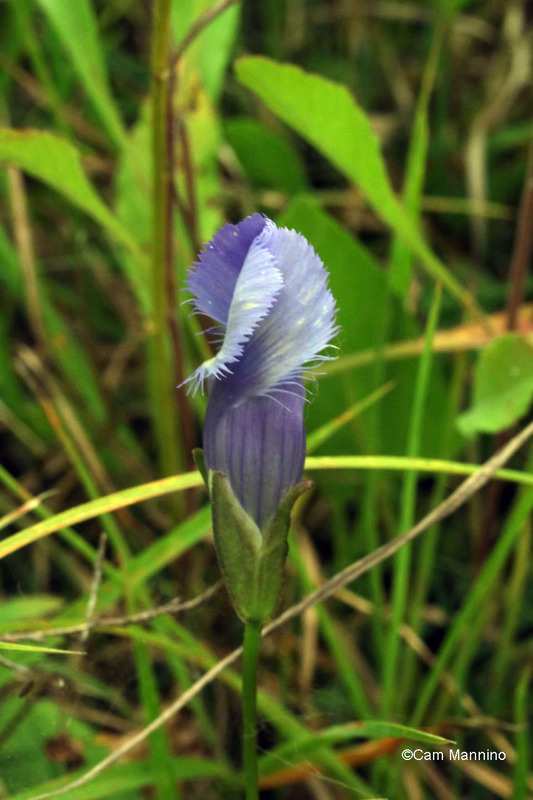 Flowers in wet prairies like this are special – and very lovely. Bring binoculars so you can scan the field since the area is too fragile for hiking or paths at this stage. I was lucky enough to be introduced, very carefully, to this magical place by Dr. Ben who let me take photos so we could share the native beauty that exists in this special area. 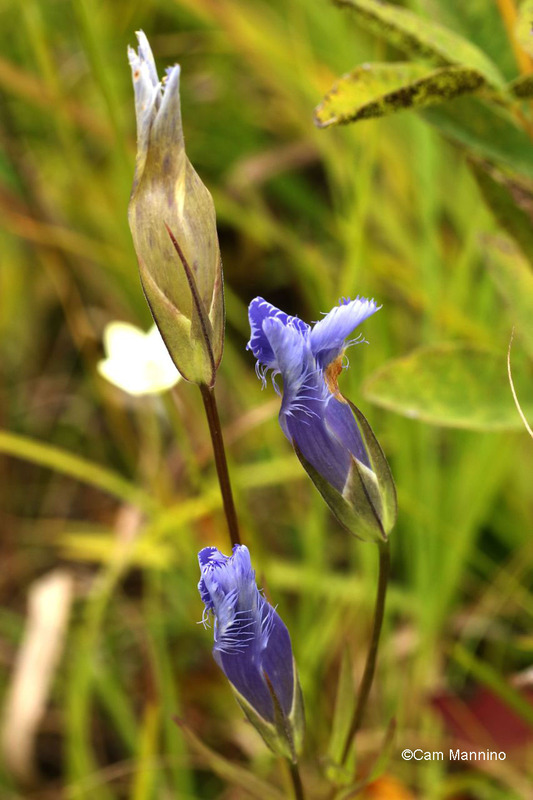 We saw deep sky blue Fringed Gentian (Gentianopsis crinita) in several stages of unfurling. 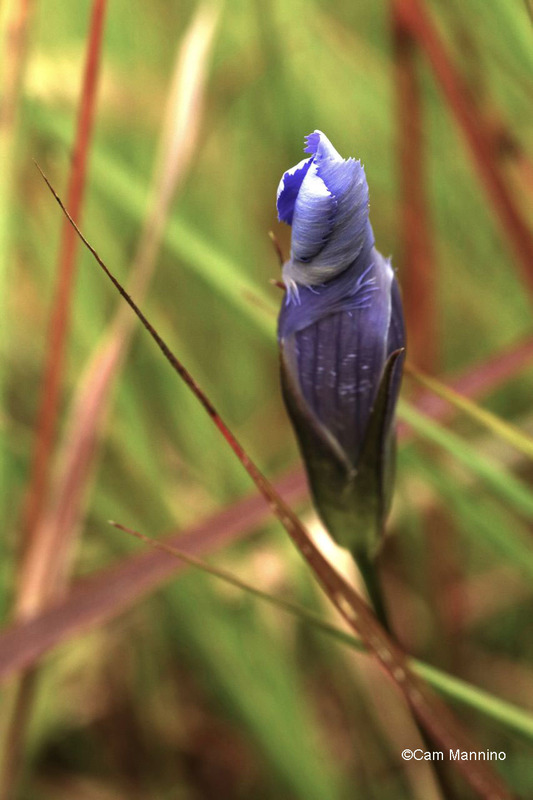 A Fringed Gentian bud with its fringes curled around it. And finally, an open one! Look at the square opening made by the four leaves! 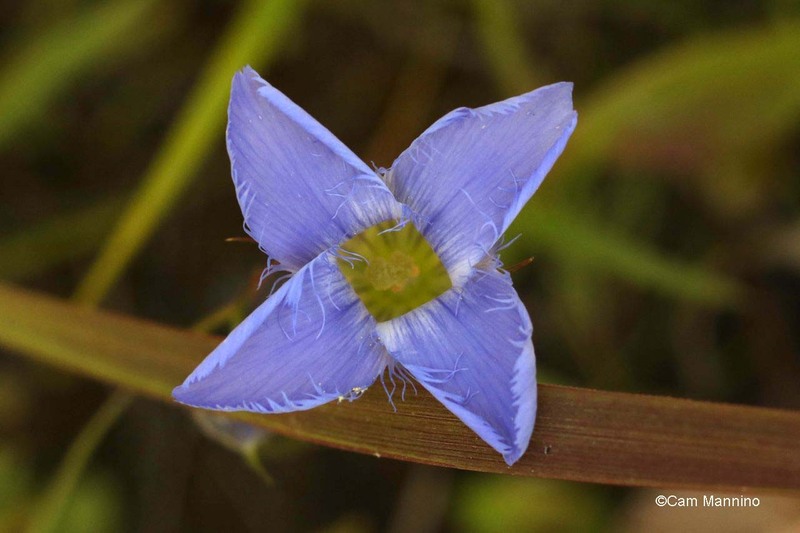 The four leaves of the Fringed Gentian make a lovely square opening at the center of the blossom. 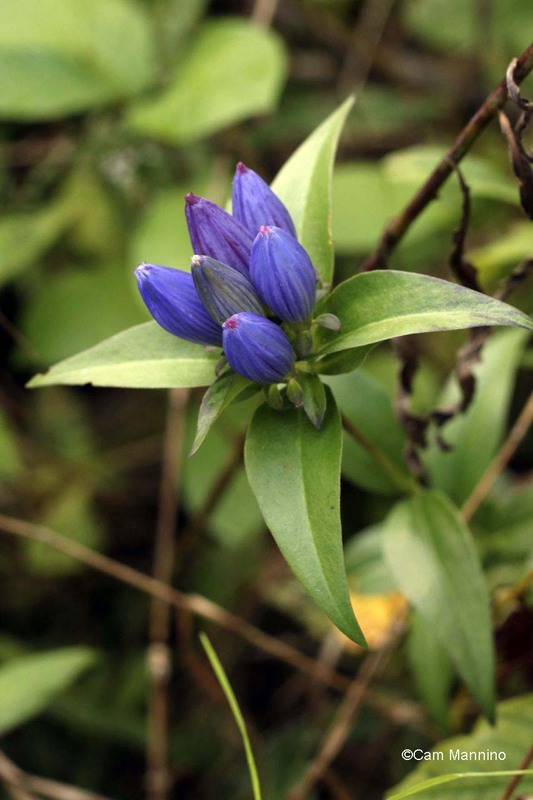 Another deep blue beauty, Bottle Gentian (Gentiana andrewsii), never opens its blossoms, but Ben saw a native Bumblebee pry one open and climb inside to get at the pollen! The flowers of Bottle Gentian never open so bumblebees just pry them open and squeeze inside! 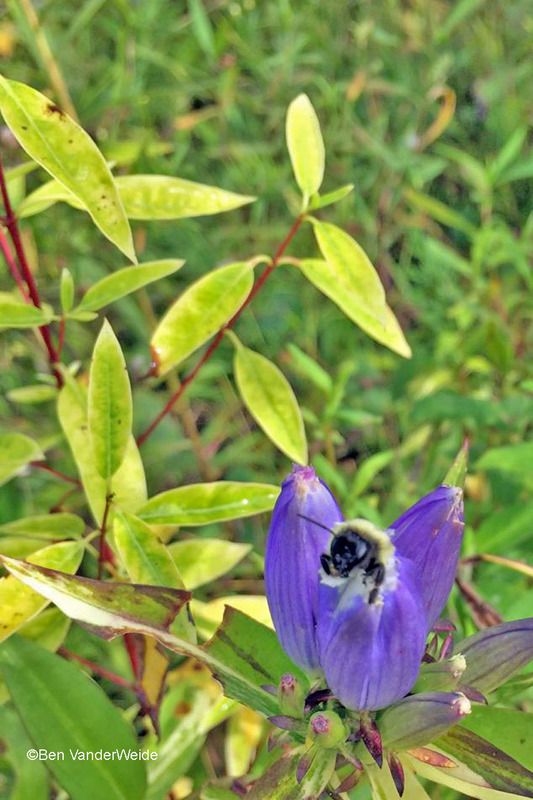 And here’s Ben’s photo of a bumblebee emerging from a Bottle Gentian at Gallagher Creek Park. Quite a moment to catch, eh? Dr. Ben’s photo of a bumblebee emerging from a Bottle Gentian blossom that it squeezed into. Tiny orchids appear here and there in the Wet Prairie as well. Who knew we had orchids? 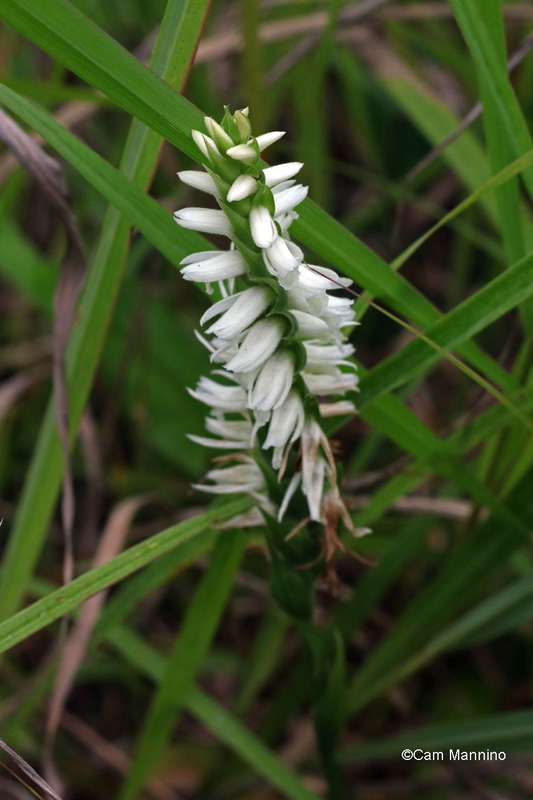 You can see where it got its name, Prairie Ladies Tresses (Spiranthes magnicamporum). It looks like a spiraling french braid. 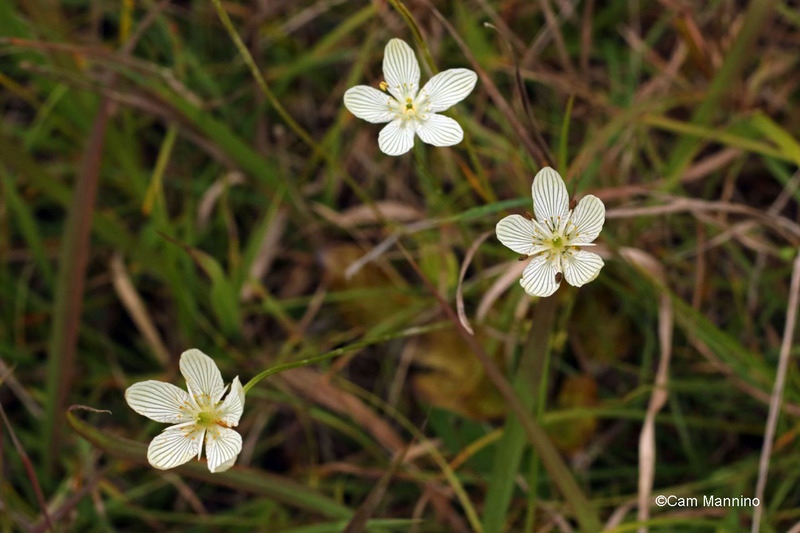 One of my favorite Wet Prairie wildflowers is Grass-of-Parnassus (Parnassia glauca) but until this week I’d only seen one or two blooms. Here’s a closeup from a few years ago of one with its dark green stripes. 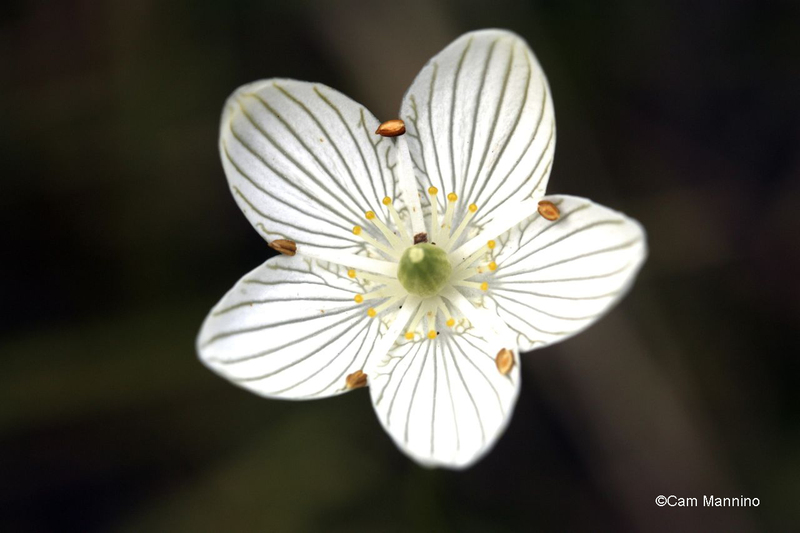 A green-striped Grass-of-Parnassus bloom, a native wet prairie wildflower. Now, thanks to the stewardship efforts of the Parks and Recreation Commission, they’re sprinkled all over the prairie! They’re a bit beyond their peak now, but they’re still lovely. 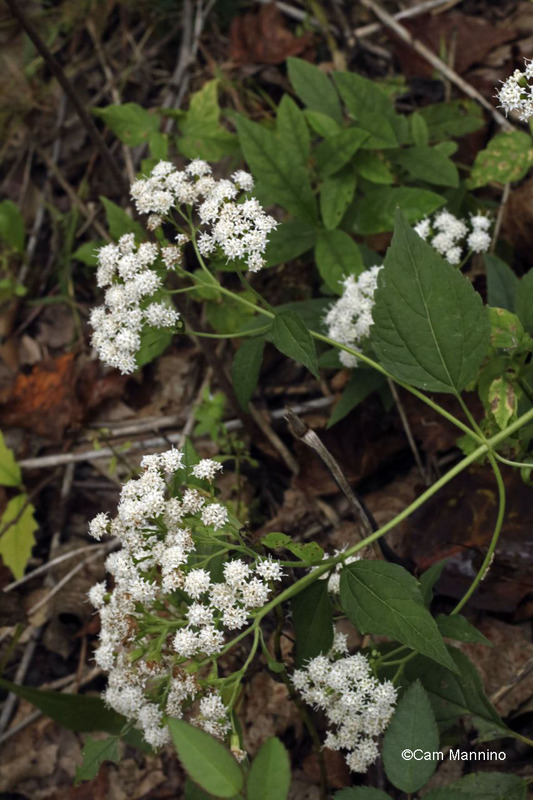 White Snake Root (Ageratina altissima) grows in the prairie and it’s plentiful on the east side of the trail, flowing downhill toward the creek. White Snake Root spills down the hillside that leads to the creek across the trail from the prairie. Cylindrical Blazing Star (Liatris cylindracea), another native plant that was plentiful a couple of weeks ago on the Wet Prairie, is finishing up now, but here are a few late blooms and then its very lovely fruit in the photo just below. The fruits of the False Asphodel (Triantha glutinosa) add a touch of fall color to the prairie. Turtlehead (Chelone glabra), with its descriptive if not very elegant common name, is another special plant in the Wet Prairie. 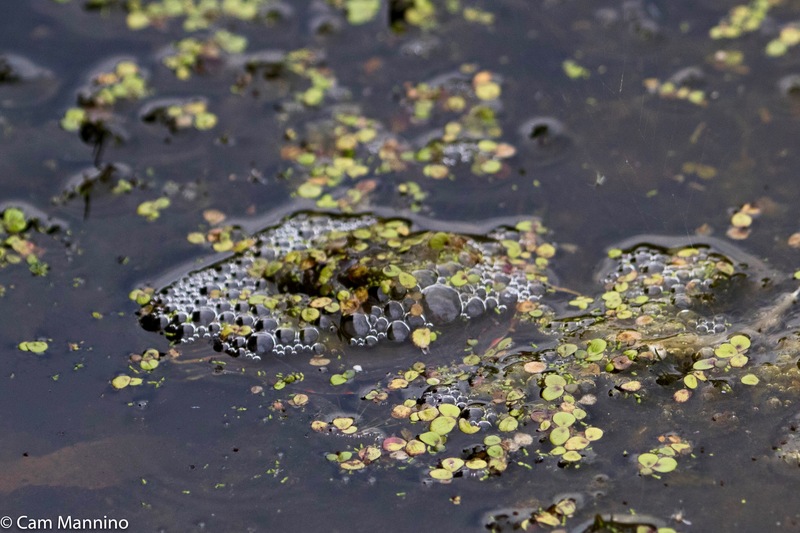 It can also be found in other high quality wetlands in our area. Turtlehead is a very practical name for a rather elegant wet prairie plant. 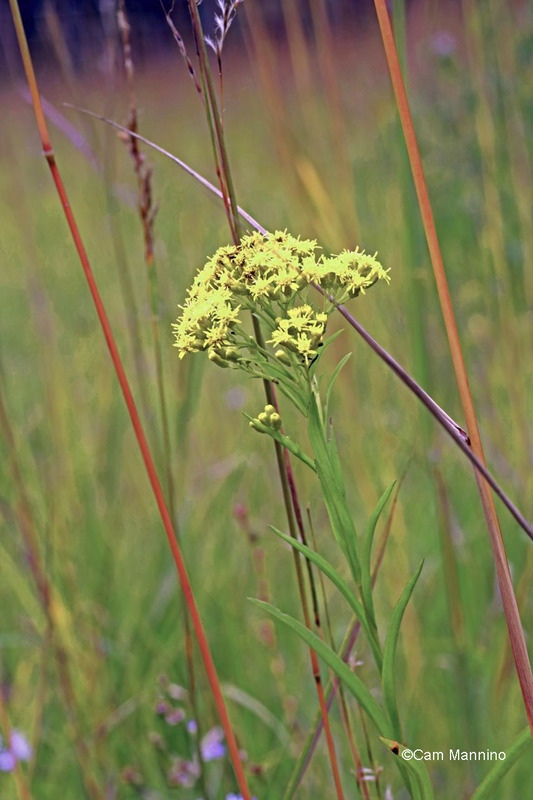 Of course, familiar native wildflowers are present in this prairie as well, like Canada Goldenrod. 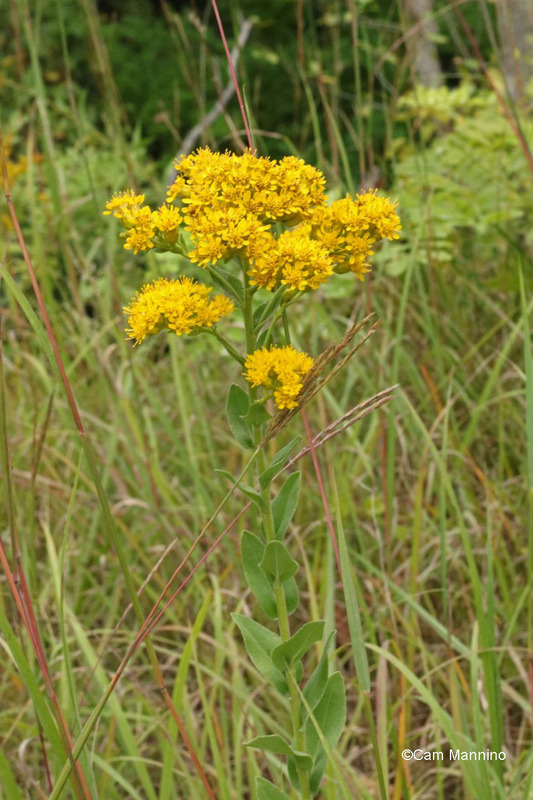 But there are other kinds of goldenrod here too, like Riddell’s Goldenrod (Solidago riddellii) which is much less common because it frequents wetlands, including wet prairies, rather than dry fields and roadsides. 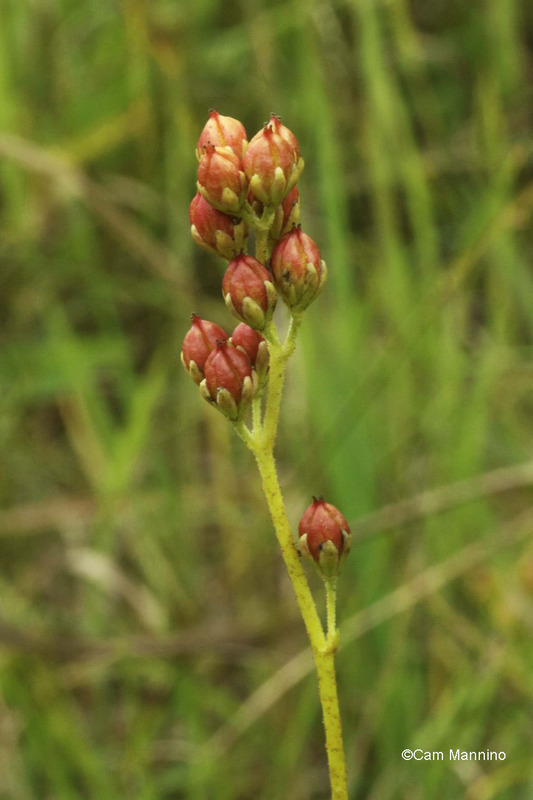 Riddell’s Goldenrod is less common in our area than our old friend, Canada Goldenrod. And across the trail from the prairie, we saw Stiff Goldenrod (Solidago rigida). I love the way the soft leaves clasp the stalk. Stiff Goldenrod is also less common than the familiar Canada Goldenrod we see along the roadsides and in dry open fields. 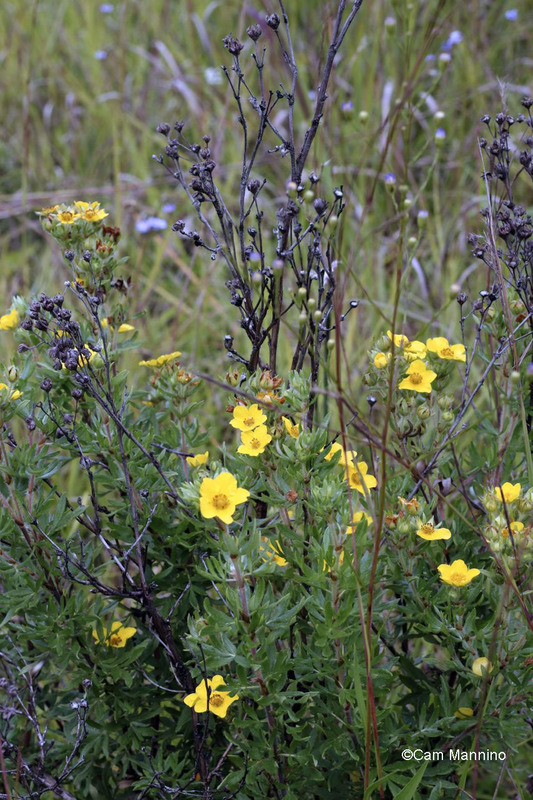 The dry Old Fields in our parks tend to have non-native Cinquefoils but the Wet Prairie hosts a native Michigan species, called Shrubby Cinquefoil (Dasiphora fruticosa) which is often used in landscape settings as well as being found in wild wet areas. Shrubby Cinquefoil is a native cinquefoil rather than the non-natives that frequently show up in abandoned fields. 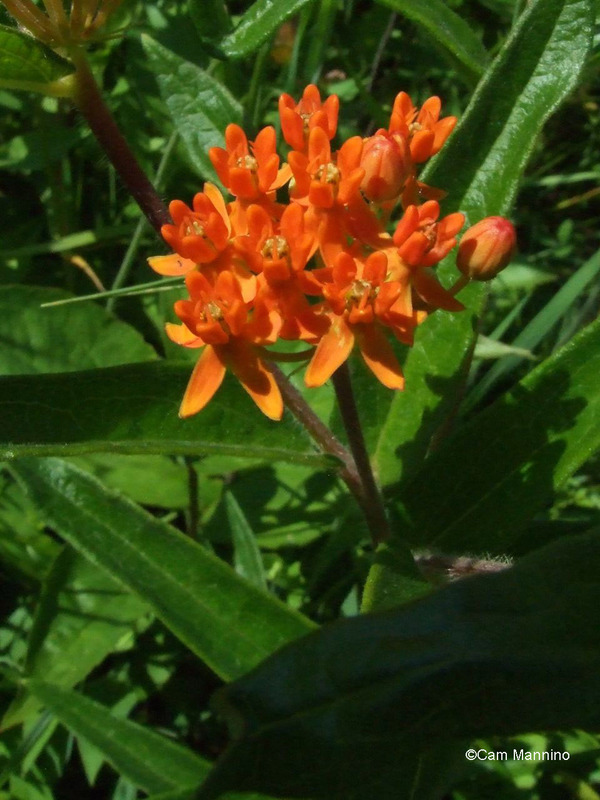 We saw another old friend, one late bloom of the gorgeous orange Butterfly Milkweed (Asclepias tuberosa). 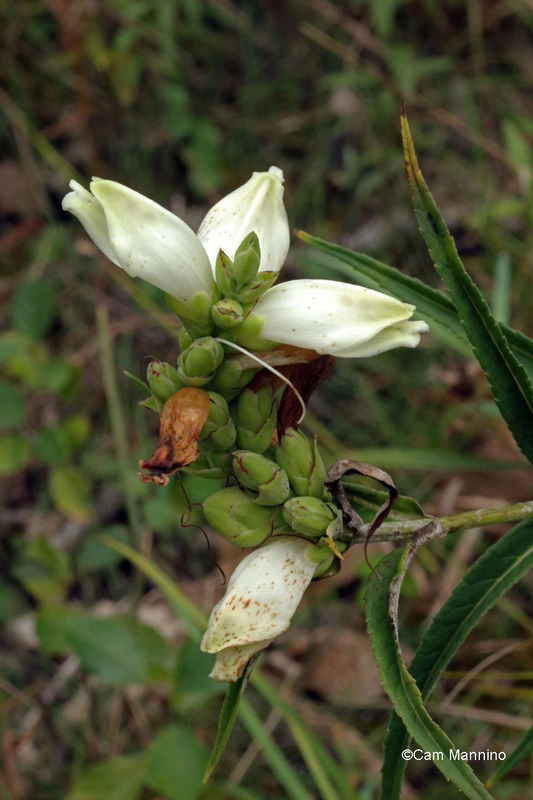 We saw a late bloom of Butterfly Milkweed, a native wild flower found often in dry areas. 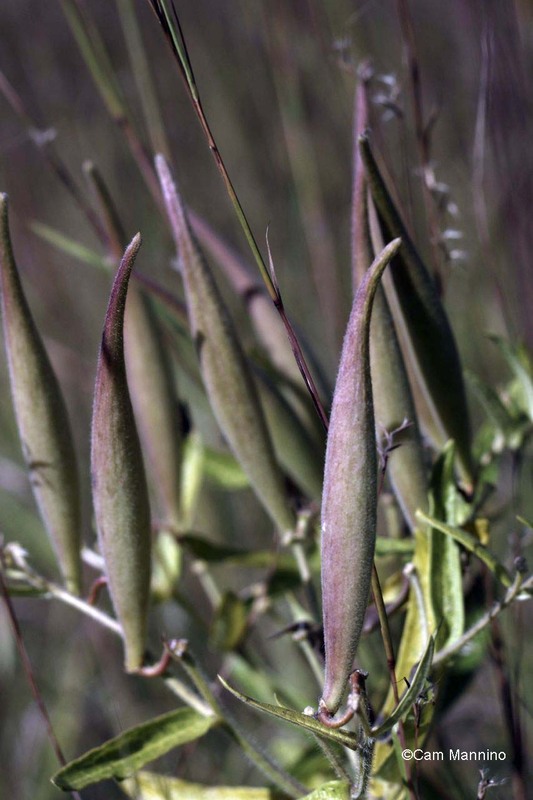 Most of the the Butterfly Milkweed plants, though, are past blooming and are producing their elegant tapered pods, the fruits that contain their seed, seen below spilling onto the ground to be carried by the wind for next year’s crop. 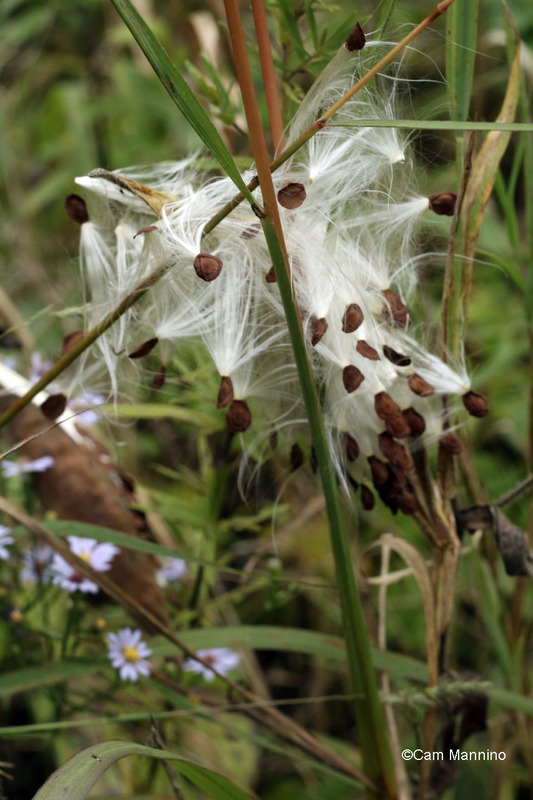 Butterfly Milkweed seeds with the silk that will help them disperse when the wind catches them. Although its small white flowers are done for the year, I love the deep purple stems of Northern Bedstraw (Galium boreale), which are still standing among the flowers. 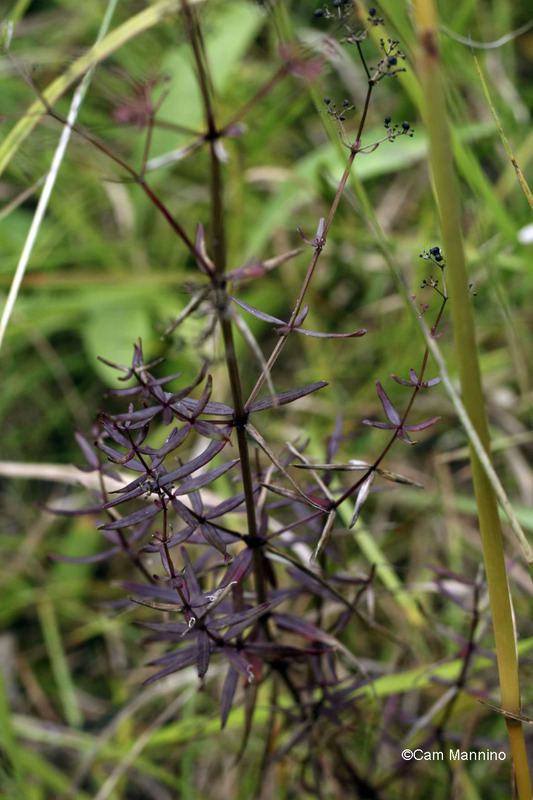 Northern Bedstraw’s white blossoms are gone, leaving these deep purple stems. A Monarch butterfly(Danaus plexippus)rested in the shade of a tree after flitting across the Wet Prairie. A female Monarch butterfly rested briefly on a leaf after flitting across the Wet Prairie. A curious European Praying Mantis (Mantis religiosa) paused on a Little Bluestem stalk where she might have been planning to lay eggs, as these non-native insects do in September. 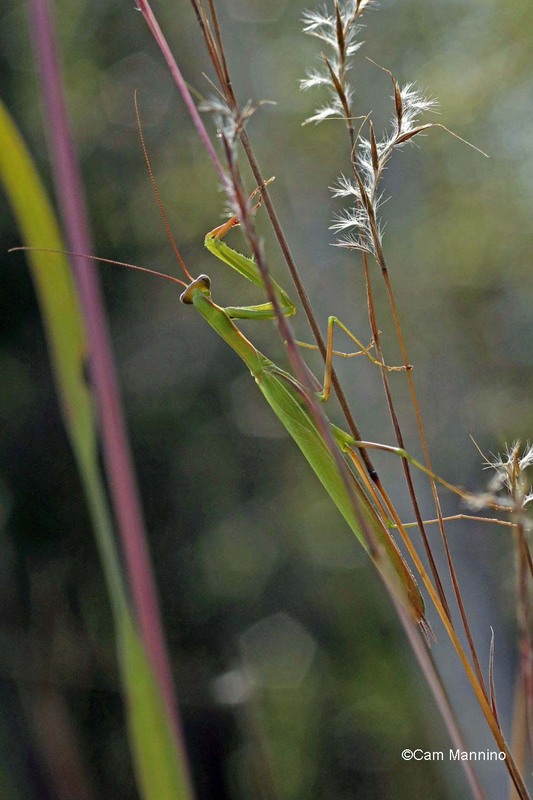 A European Praying Mantis may have been planning to lay eggs on a hole in a grass stem. A Green Darner (Anax junius), a large, very agile dragonfly, took a break from patrolling for insect pray and rested in the shade. A Green Darner, a large dragonfly, escapes the noonday sun. And a tiny Snapping Turtle (Chelydra serpentina) hatchling, about the size of a 50 cent piece, tried to make it across the trail. We gave it a little lift to the grass in the direction it was heading. 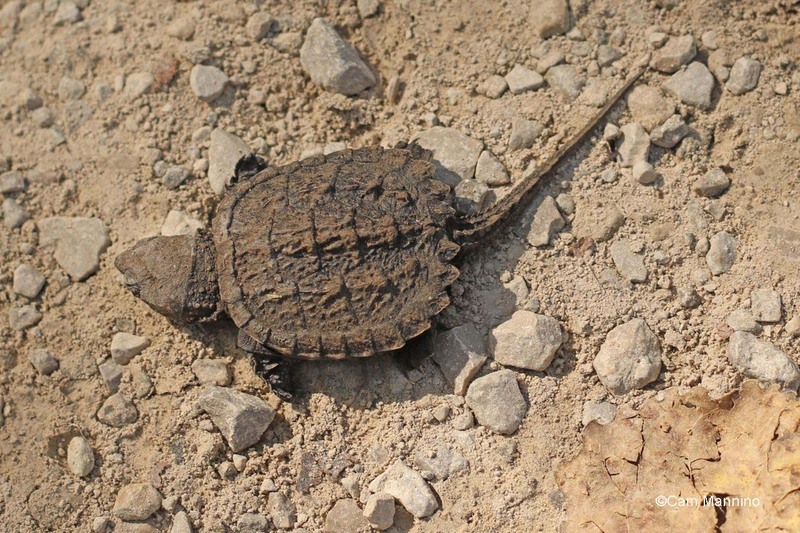 A tiny Snapping Turtle hatchling struggles to get across the trail. 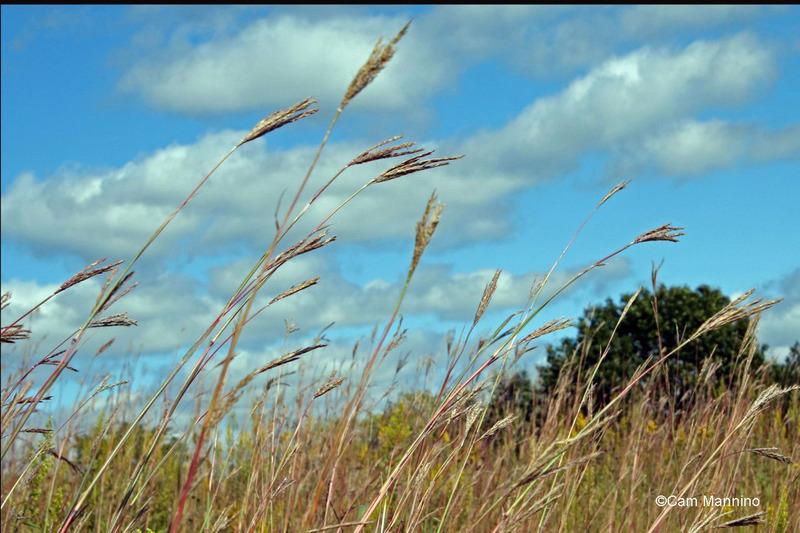 Native grasses thrive in the Wet Prairie as well. 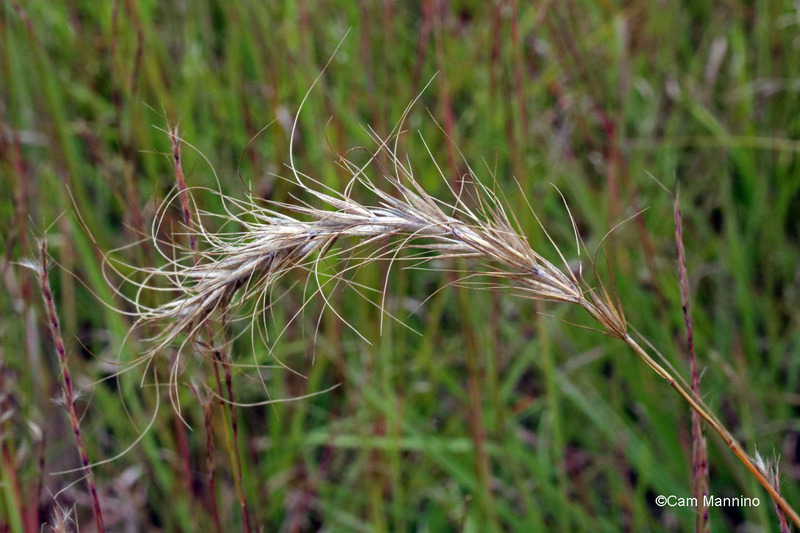 Big Blue Stem (Andropogon gerardii), a classic native prairie grass, towers over everything with its characteristic turkey foot. Big Blue Stem, a classic prairie grass, towers over the other grasses and wildflowers. 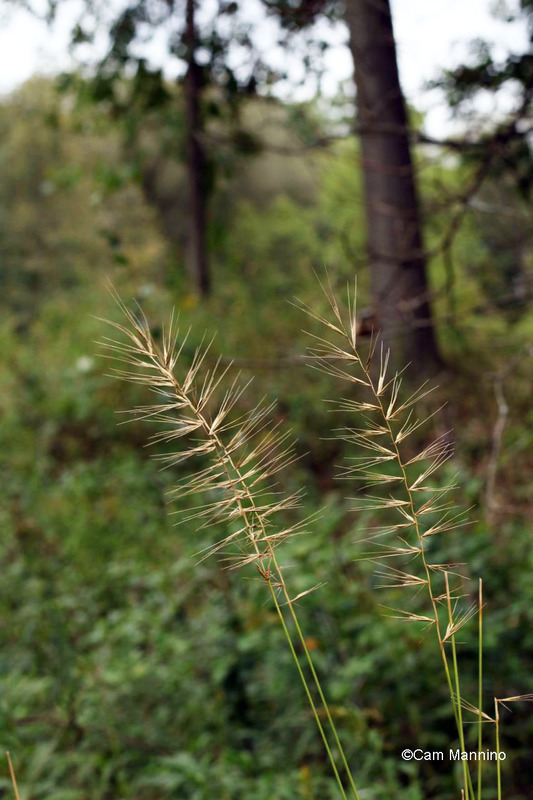 Canada Wild Rye (Elymus canadensis) bobs in the breeze below the Big Blue Stem. Canadian Wild Rye bobs in the breeze below the Big Blue Stem. 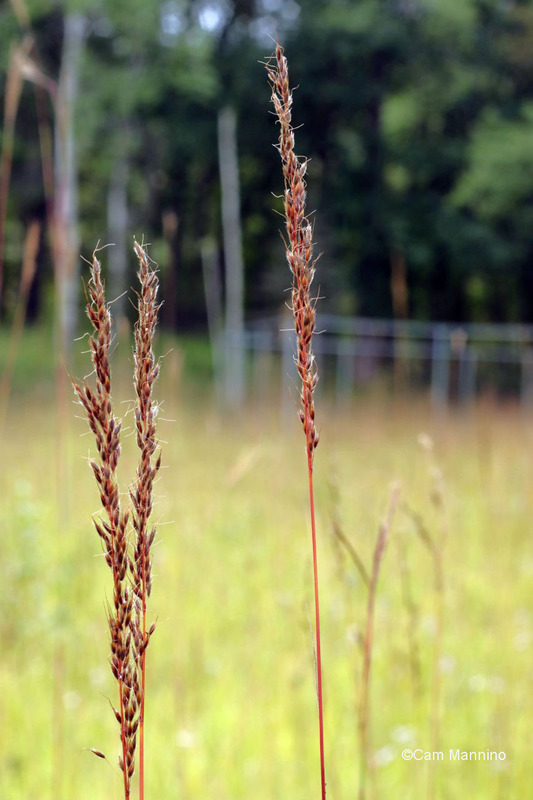 According to the Missouri Botanical Garden, the scientific name of this grass, Sorghastrum nutans, means “a swaying, poor imitation of Sorghum.” I think I prefer the common name, Indian Grass! It’s not difficult to see where native Bottlebrush Grass (Elymus hystrix) got its name! A native plant aptly named Bottlebrush Grass. Restoring and preserving the very special habitat of the Wet Prairie is a way to preserve our history for future generations and to encourage plant diversity. But it takes a lot of effort! 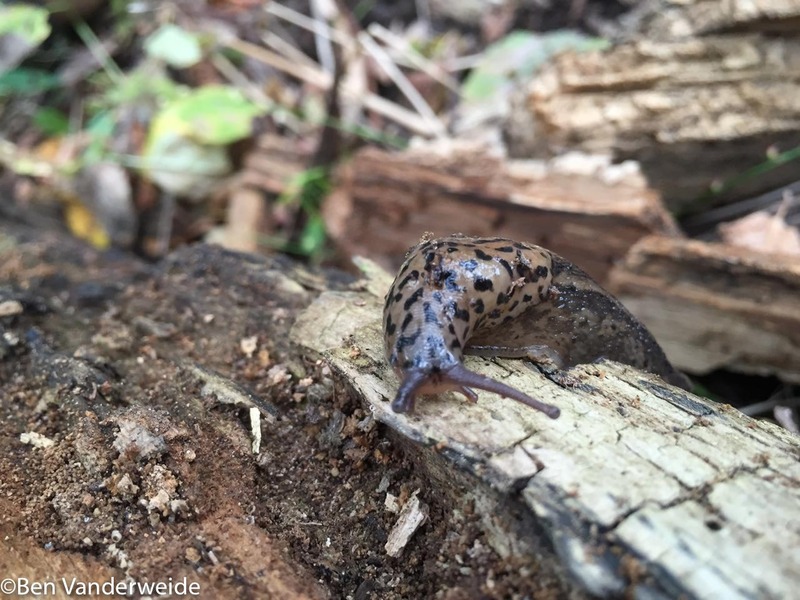 Please keep an eye on the “Stewardship” tab on our home page here at the Natural Areas Notebook for volunteer opportunities. 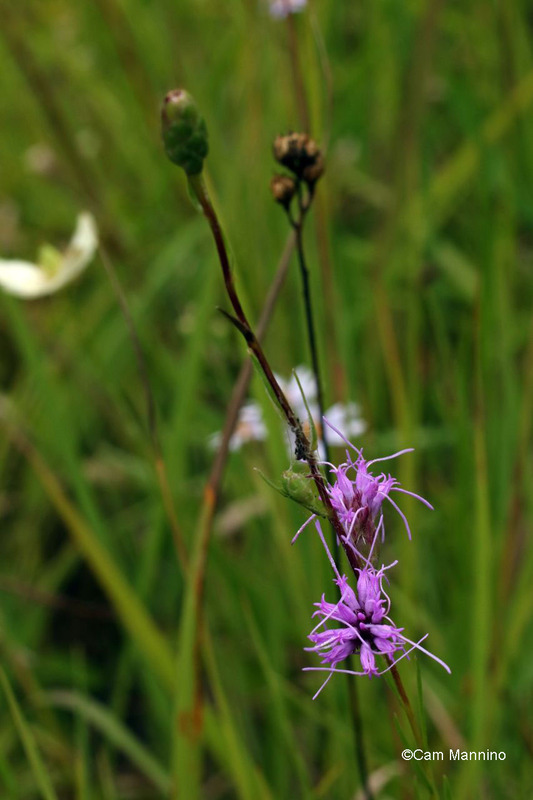 Perhaps you can help Dr. Ben with the PRC’s ongoing effort to care for the Wet Prairie with its unusual selection of beautiful wildflowers and graceful grasses. *Footnote:  My sources for information, as well as Oakland Township Stewardship Manager Dr. Ben VanderWeide, are as follows: Ritland, D. B., & Brower, L. P. (1991). The viceroy butterfly is not a Batesian mimic; Stokes Nature Guides:  A Guide to Bird Behavior Volumes 1-3, Allaboutbirds.org, the website of the Cornell Ornithology Lab at Cornell University; Wikipedia; http://www.butterfliesandmoths.org; Herbarium of the University of Michigan at michiganflora.net. ; various Michigan Field Guides by Stan Tekiela; Butterflies of Michigan Field Guide by Jaret C. Daniels; University of Wisconsin's Bug Lady at www4.uwm.edu/fieldstation/naturalhistory/bugoftheweek/ for beetle info http://www.migrationresearch.org/mbo/id/rbgr.html for migration info, and invaluable wildflower identification from local expert, Maryann Whitman.